(Ministry of Economy, Trade and Industry). 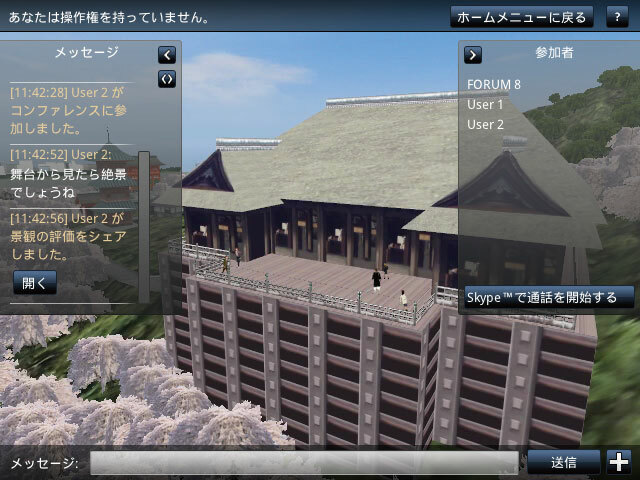 which you can give a variety of presentations in real-time. 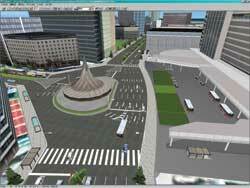 3D VR data creation by simple operations is available. 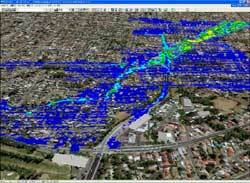 Practical data features include our standard database, a Web/Road Database and a LandXML data exchange function. 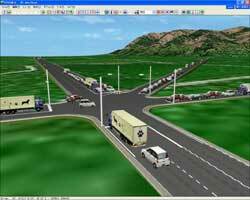 It is equipped with an excellent VR creation / editing function for everything from road alignments, cross sections and terrain processing to traffic setup, model setup / processing, etc. 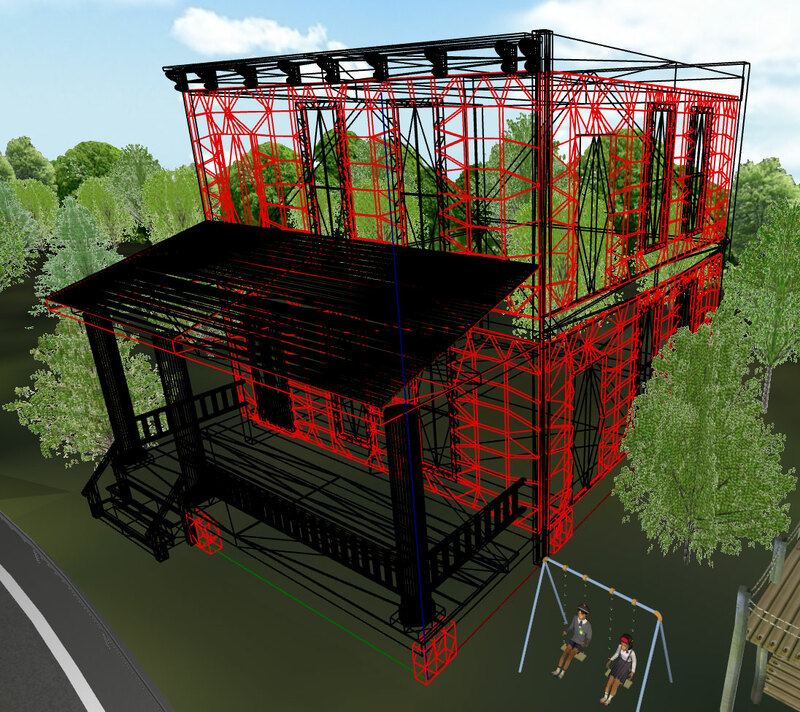 Large-scale 3D spaces can be made by simple procedures in a surprisingly short time. 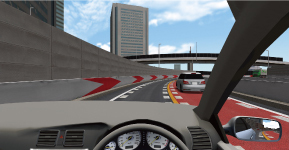 It assists engineering design, development and research whilst also supporting advanced simulation by sunshine simulation, traffic flow simulation, manual drive simulation, etc., in addition to drive simulation. 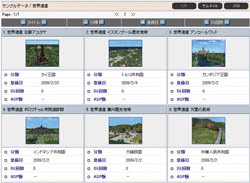 Terrain data and map are included on the database. 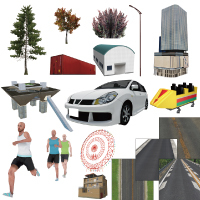 In addition to the standard data including 3D models and textures, extensive downloads are available directly from the UC-win/RoadDB on the Internet. Useful editing and movement tools are available, allowing scaling up and down, movement, rotation, inclination and arrangement of models. 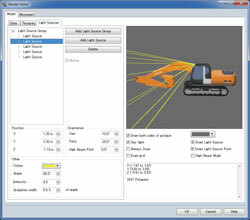 Action setting offers generation and motion control of moving models. 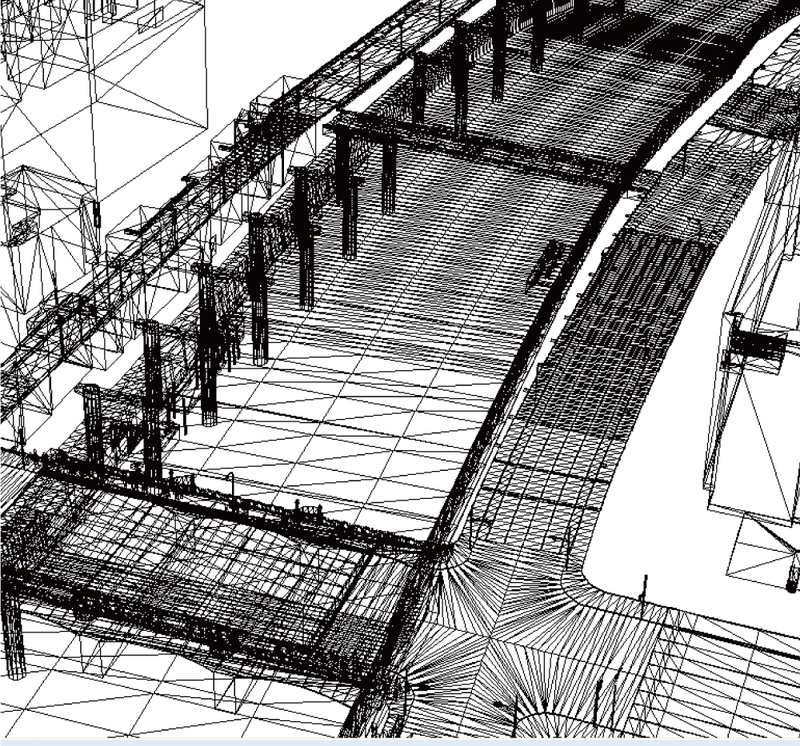 Signs, stairs, escalators, and fences can be created by using parametric entering. 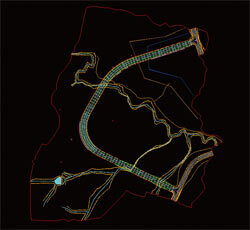 Easy creation of a complicated road structure is available with high definition. All sorts of lines such as roads, rivers, lakes or flight paths can be set up with parameters or free hand drawing and roads, tunnels, bridges, rivers or walking routes can be automatically created. 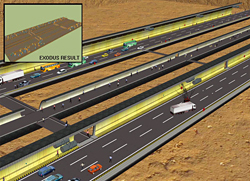 Tunnel and bridge sections are set by the definition of a horizontal road alignment (clothoid and spline supported) and a vertical alignment. Texture process and cutting and banking process considering small steps are conducted in the section definition. 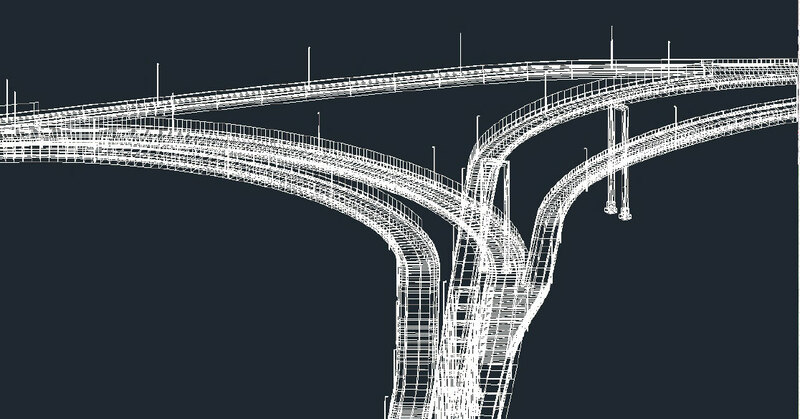 Complicated road structures can be created easily by the linear and section functions. 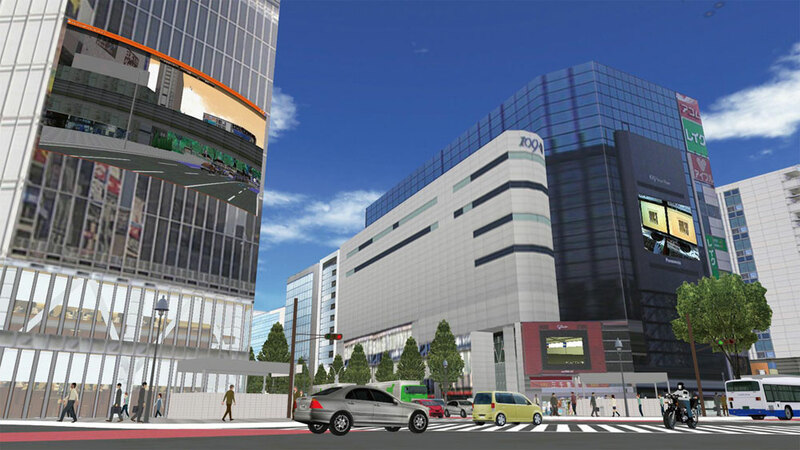 3D drawing of VR environment model supports CIM. 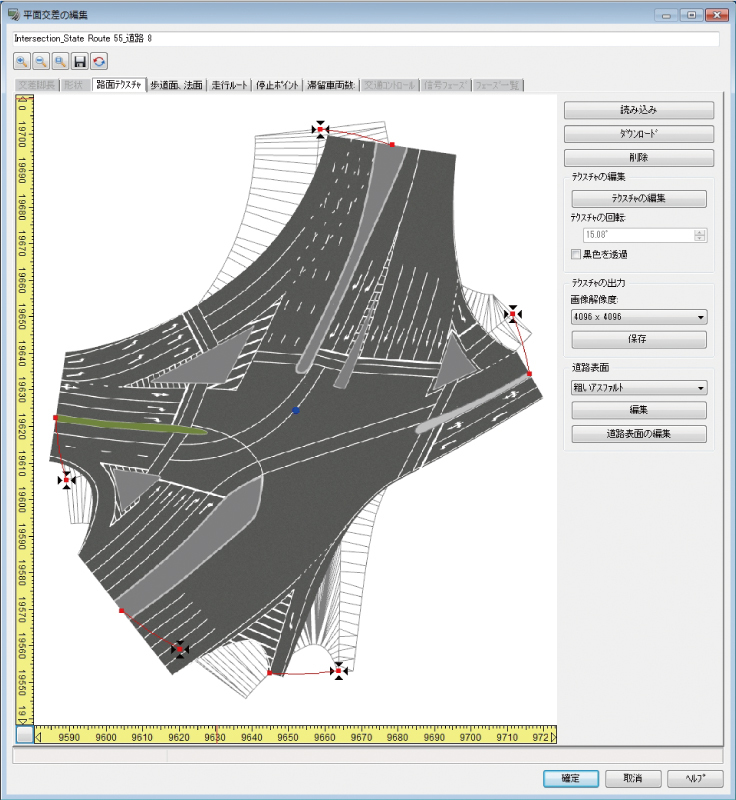 Road cross sections and 3D models can be imported from DWG/DXF files. 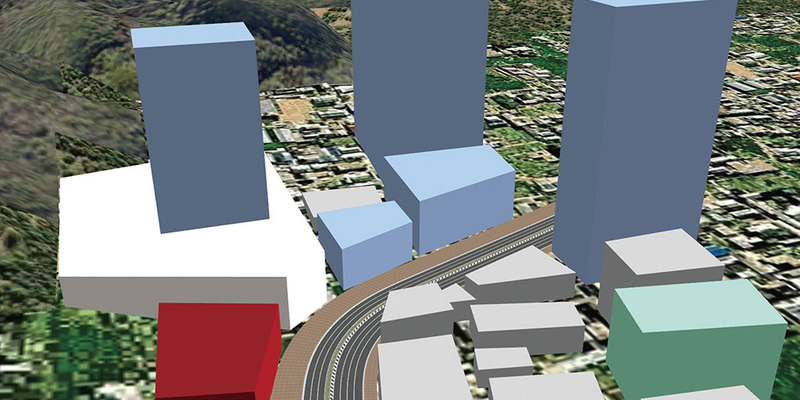 3D VR models in UC-win/Road can be exported by road, terrain and layer. 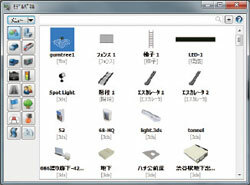 Displayed colors are also configurable. 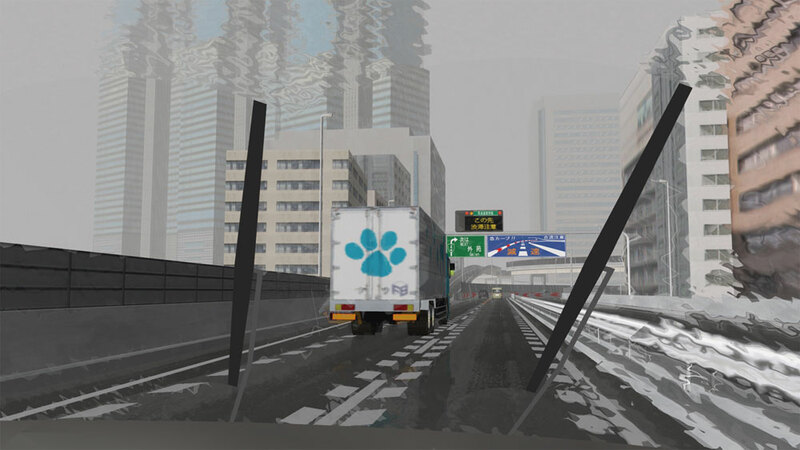 It's possible to create data from the size of a dice to a hundreds kilometers road structure in the same space. 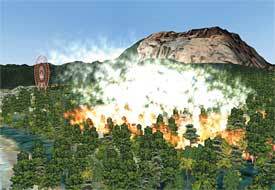 The 64 bit native support realizes the process of vast terrains and high-precision models and the LOD function also supports the dynamic display. 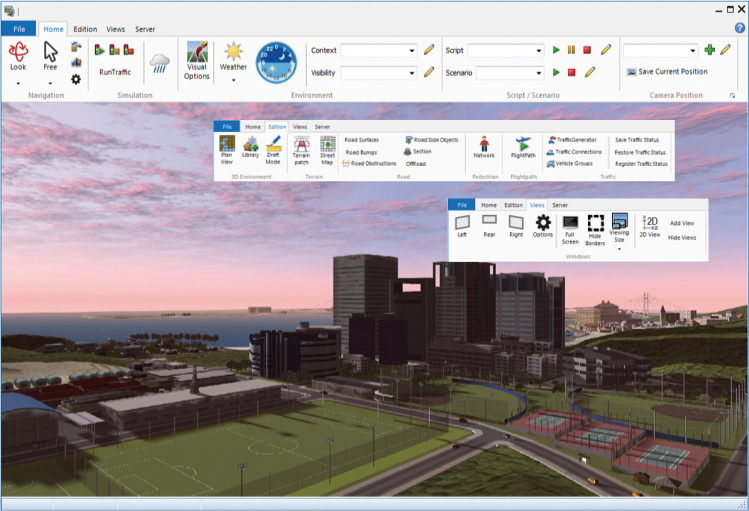 Various displays with the Visual Options Tool. 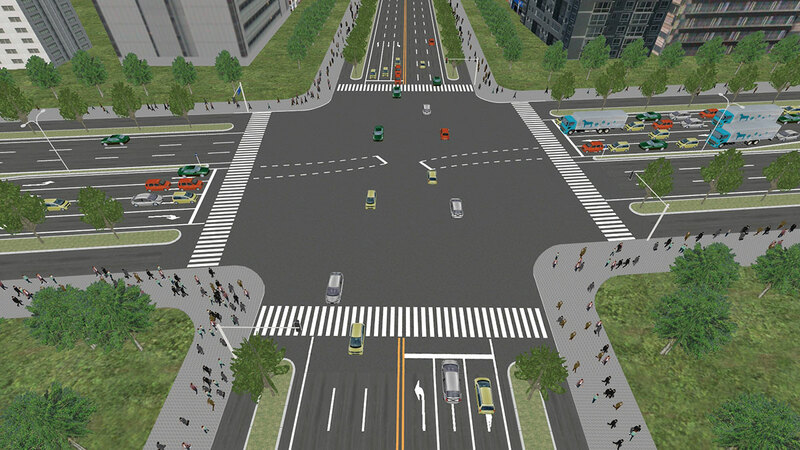 Traffic simulation of road hazards is also available. 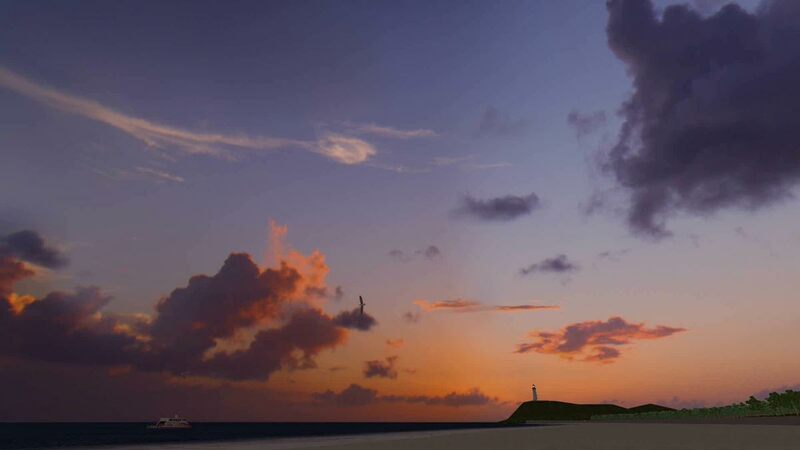 Control of time, weather and light is available in real time. 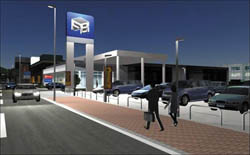 With the artificial light function, expression of day and night, and shadow is also available. 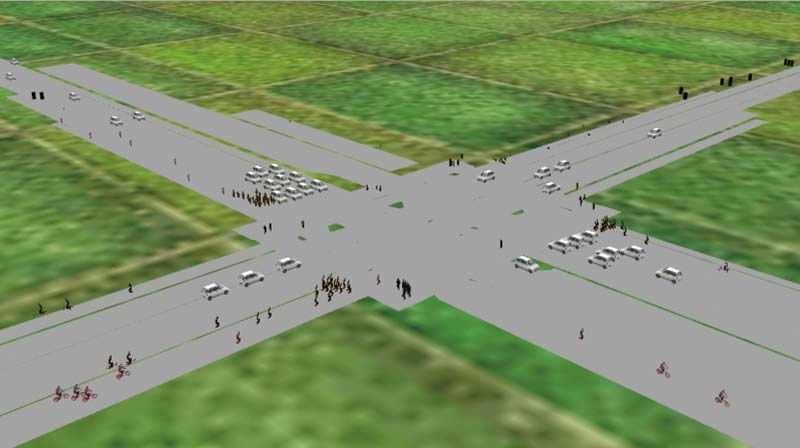 Traffic flow generation, based on traffic volume, car profiles and traffic lights, and road hazards, from disasters and accidents, can be simulated. 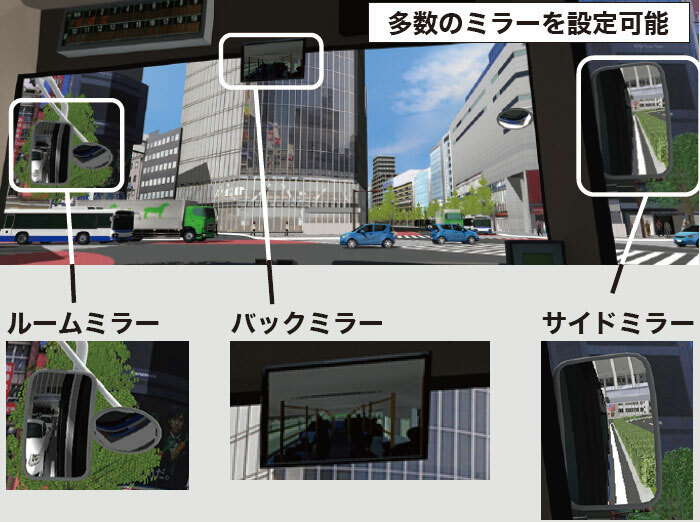 Real-time VR operation by simple operations. Helps presenters with Before/After, scripting and manual driving. 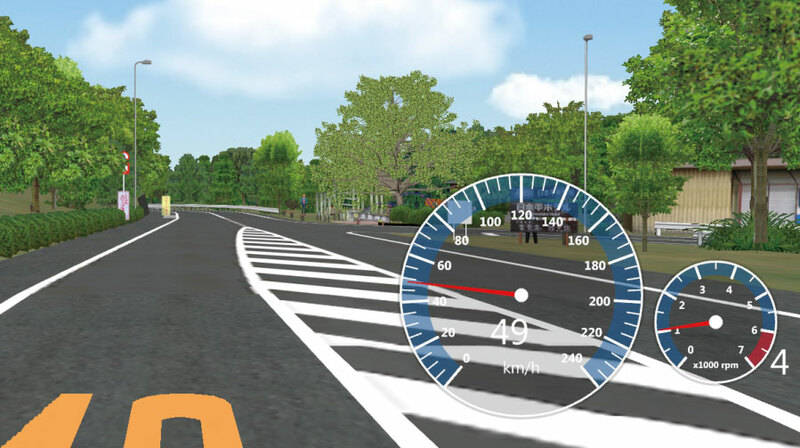 It supports several driving modes (speed of car, lane changing, height of viewpoint, viewpoint switching in 8 directions) and dynamic movement of viewpoint (from other cars, up and down, turn head). 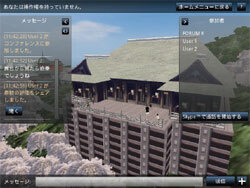 Automatic flight and walk-through are available with the flight path setting (editing in the 3D display is supported). More advanced simulation can be performed with manual driving and support for a 3D cockpit and multi-monitors. Won the Special award of the 8th CSAJ Alliance Award! 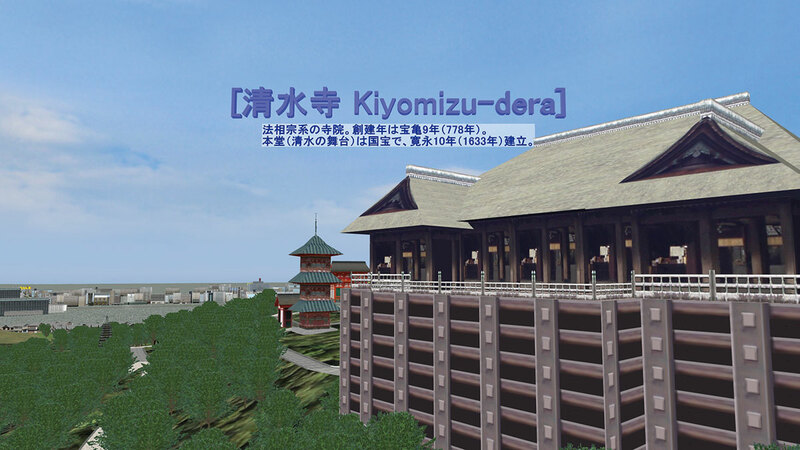 This award is organized by Computer Software Association of Japan. the number of business, future possibilities, marketability, and technology. 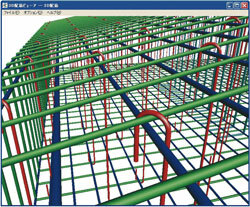 Awarded with "Outstanding Technology Award"
at the Construction Technology Expo, Kinki, 2003! SOFTWARE PRODUCT OF THE YEAR! Awarded in "Social/life category / public category"! the year under the sponsorship of the Ministry of Economy, Trade and Industry. 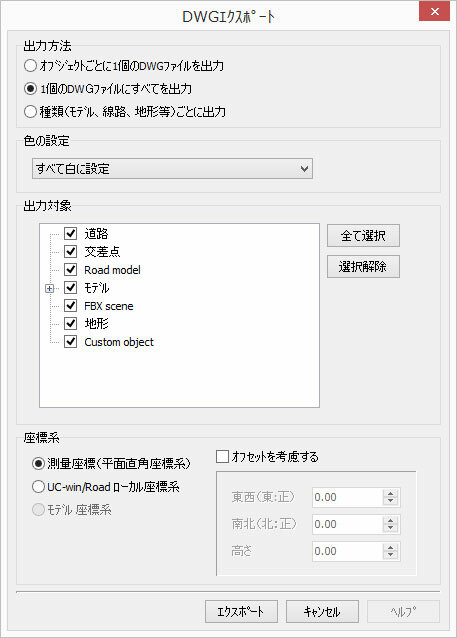 On June 28, 2017, FORUM8 acquired "Approval" certification based on the PSQ certificate system for UC-win/Road Ver.12.1. UC-win/Road Ver.6 is available in Italian. 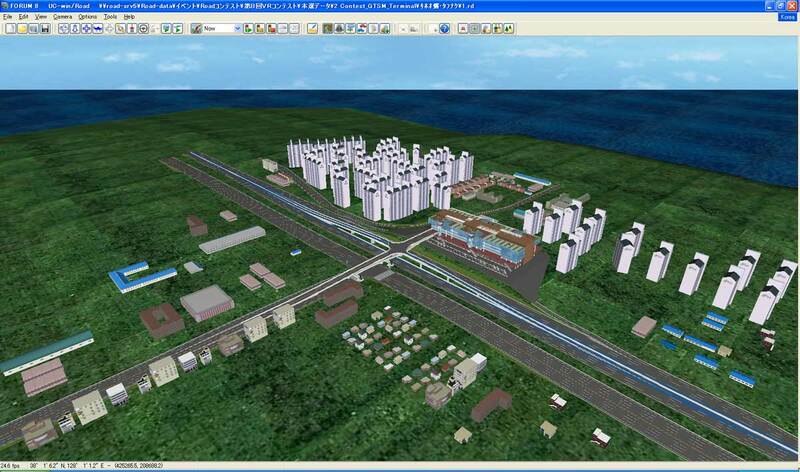 The import of OpenStreetMap and the GIS map helps the easy creation of building and forest. 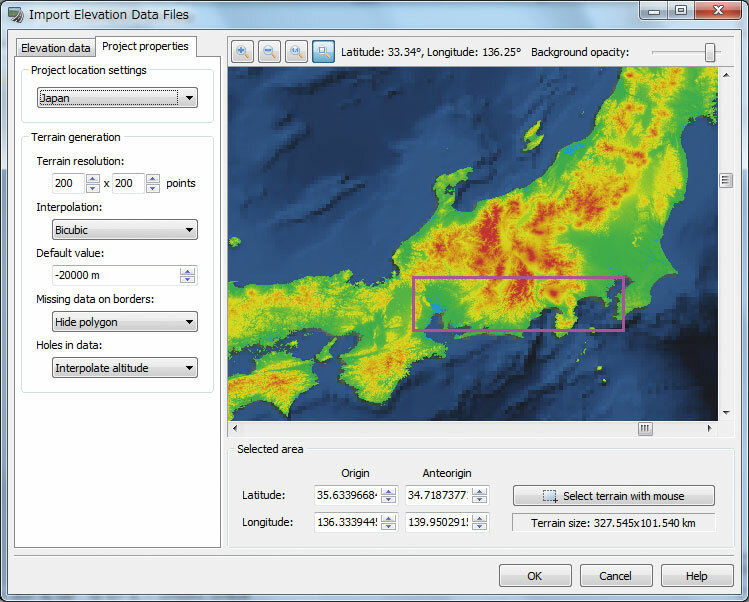 More accurate data can be created by using coordinate data of project data and converting latitude and longitude from the coordinate in high precision. 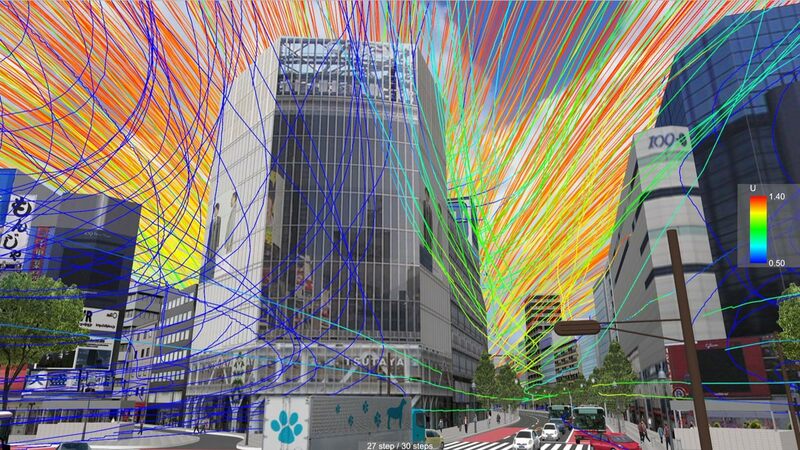 Point clouds can be displayed in LOD now for more comfortable and efficient usage of hundreds of millions of point clouds data. 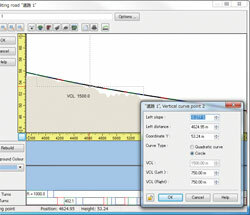 This function reduces the memory consumption during operation and the size of project files. 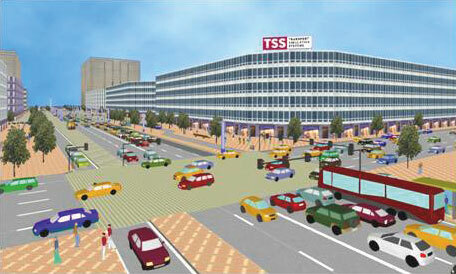 The improvement of the usability of project operation can be expected. 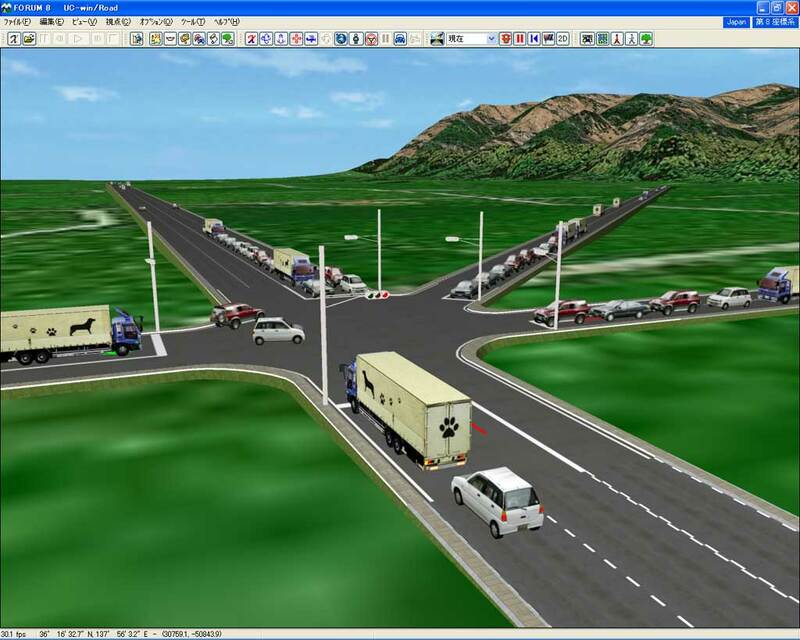 A parallel processing to accelerate the processing of 3D road shape creation. 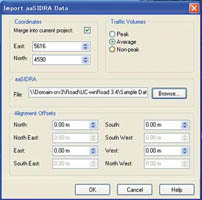 This processing reduces the time of road edit as well as the time for opening data. 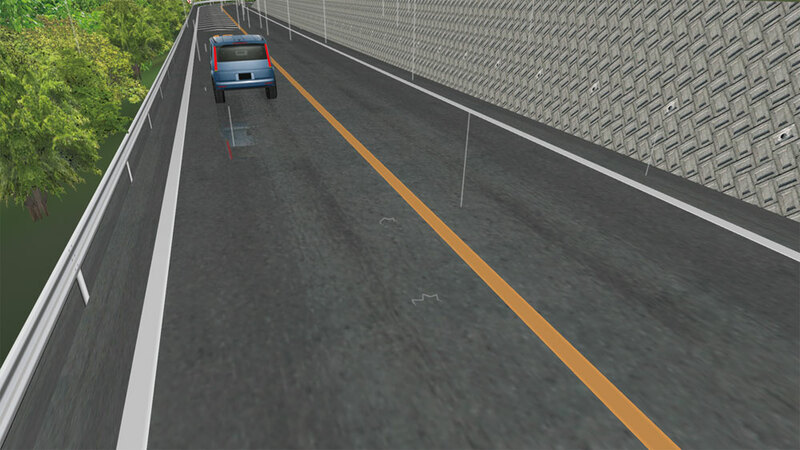 A traffic algorithm with improved calculation of steering amount to keep lane is implemented. 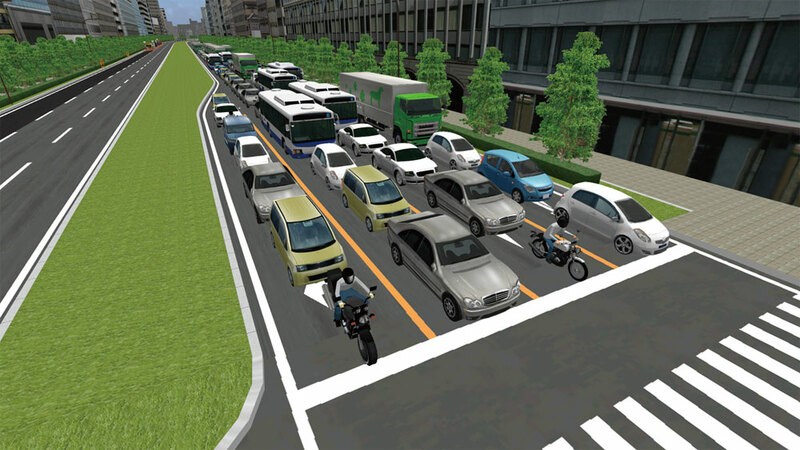 This improved the function to follow a vehicle in traffic compared to the previous version product. 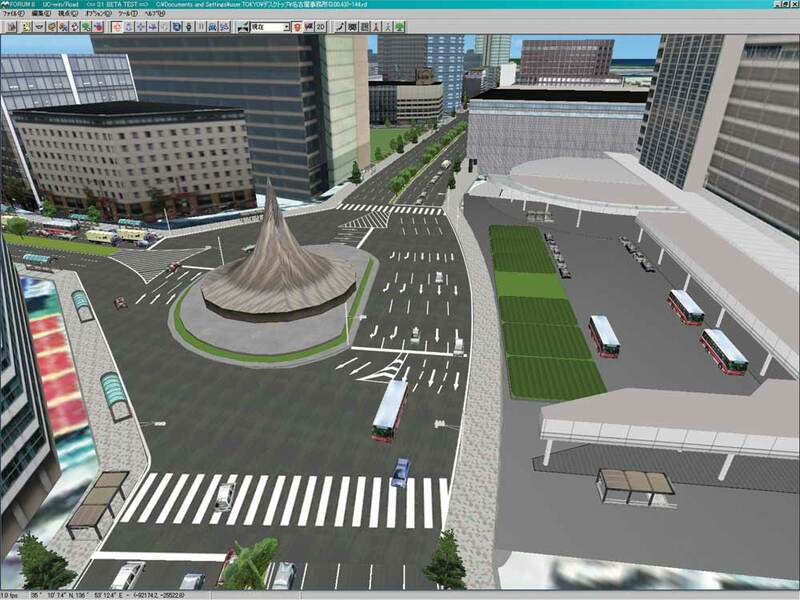 Corresponds to Civil 3D 2018. Decrease in working memory and project file memory improves the usability in project operation. 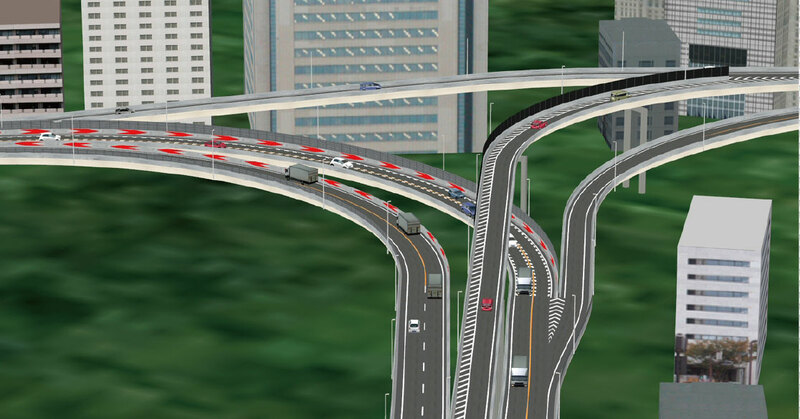 UC-win/Road can be cooperated with D-BOX, the vibration device made by BMIA. 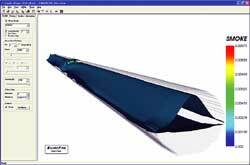 This motion system can be freely built with 1 to 7 actuators. 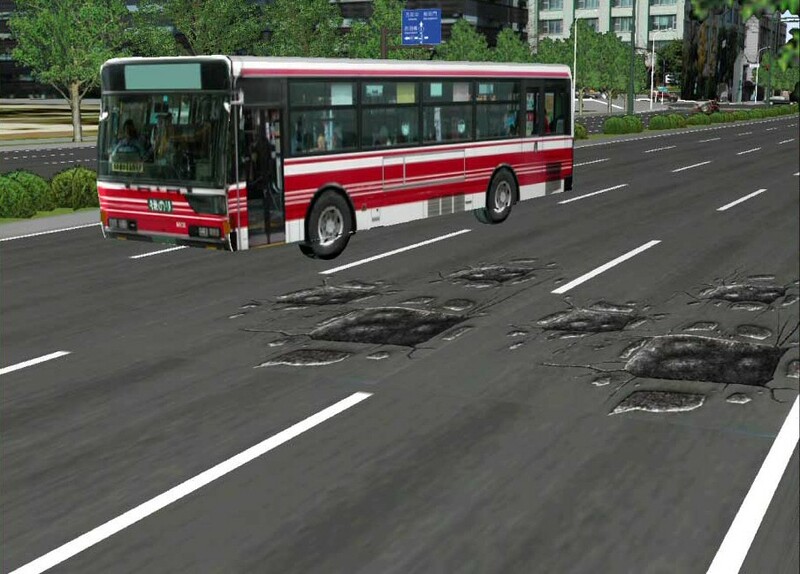 In addition to 6DOF for vehicle, it can be used for certain vibration of seat, road surface, etc. 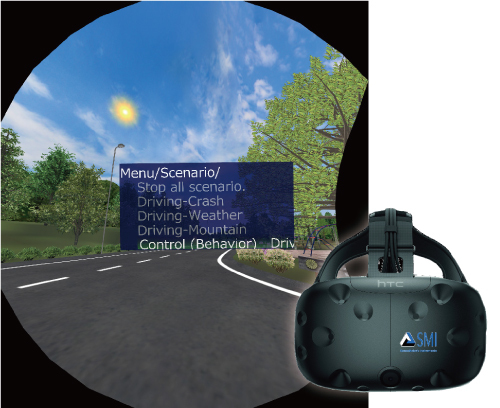 Plug-in for the cooperation between a Head Mounted Display "FOVE 0" sold by FOVE Inc. and UC-win/Road. 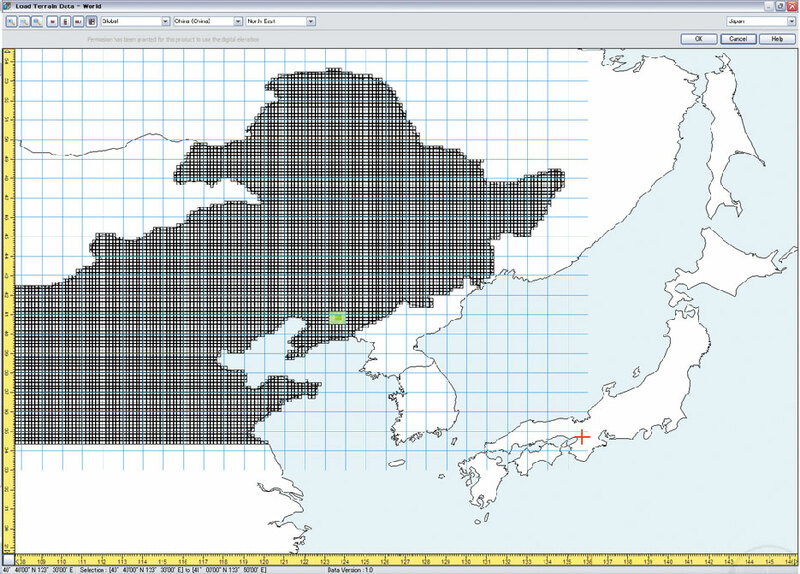 Left: 50m mesh GIS numerical map and satellite photo can be imported. 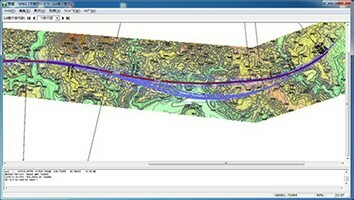 The volume of banking and cutting can be calculated from terrain and civil engineering cross section. 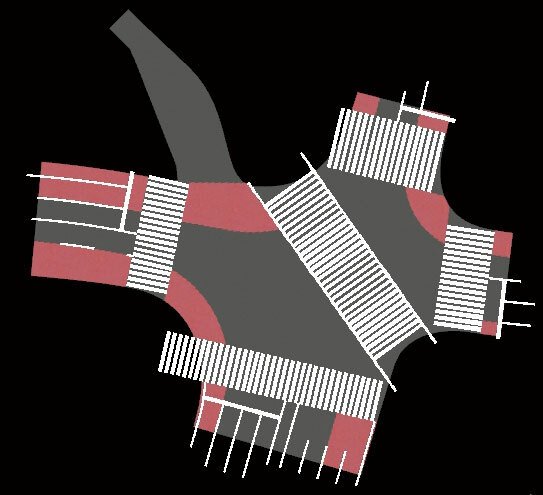 The cross section used for the calculation is automatically generated by default, and the calculation case from starting point to ending point of the roads in the project is defined. 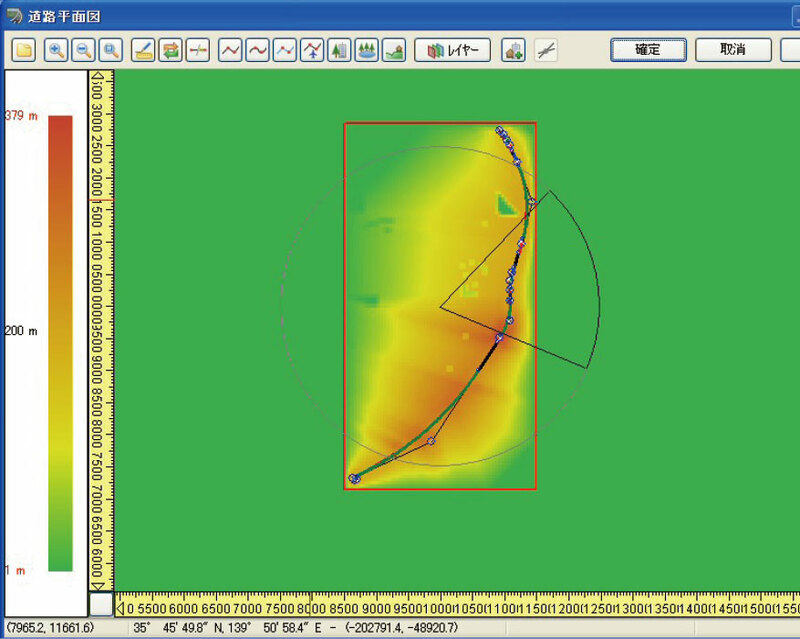 In addition, it is possible to define the earthwork cross section that users input and the calculation cases with sections set. 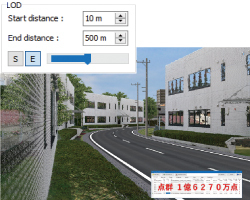 Users can also use the functions to display the civil engineering surface used for the calculation on the main screen and to export the calculation result in the CSV format. A function to create and edit polygonal zones on the terrain has been added. Users can create zones by clicking on the terrain and selecting the area around it. In addition to modifying, the following operations can be conducted to the created zone. The menu to call the quick building function has been deleted because the building creation function above now includes this function. 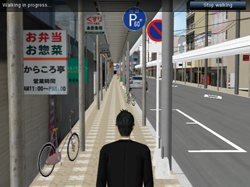 Options to play sounds in scripts and scenarios on other audio devices have been added to the Audio Setting. 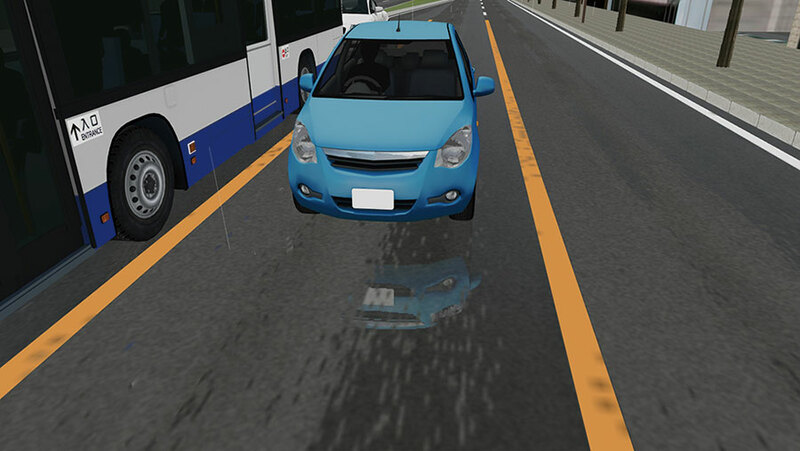 The sound expression of rain has been added. 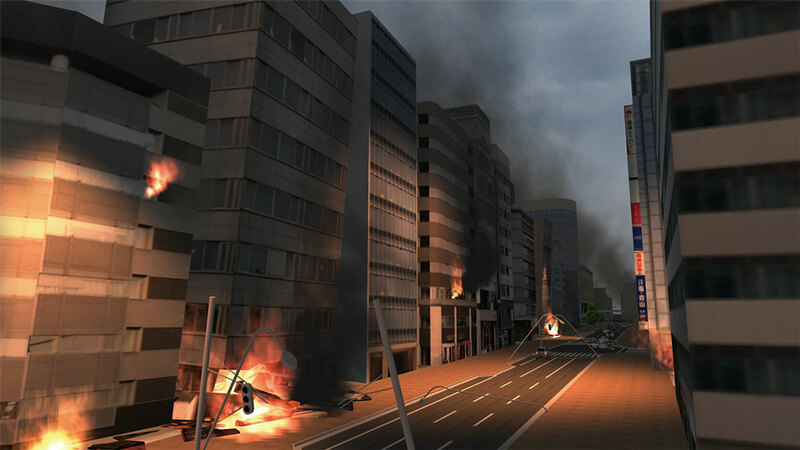 Scenes that include wind-blown dust, including leaves and clothes can now be rendered. It is available from [Wind] tab in the Visual Options. The plug-in now supports the controller device. 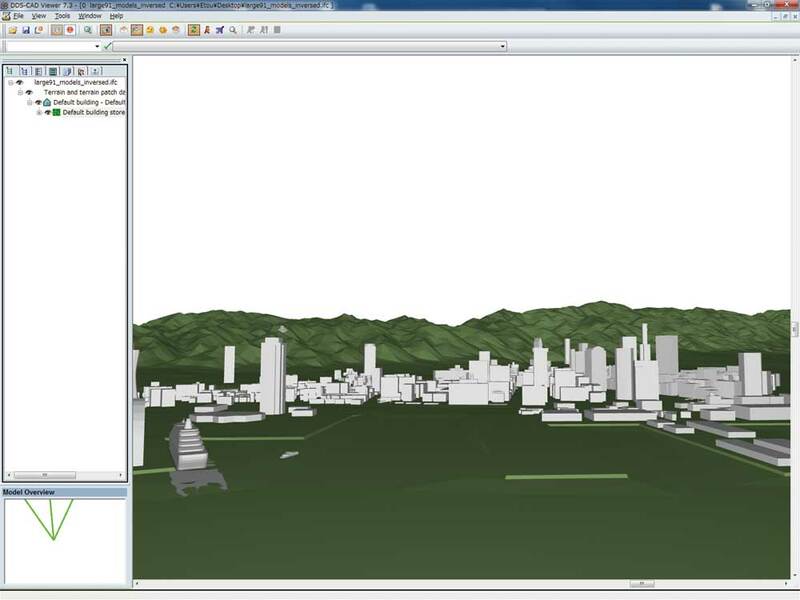 The model you set is shown on the display and the viewpoint moves according to the motion of the controller. Users can now manually record passing points by remote controller. 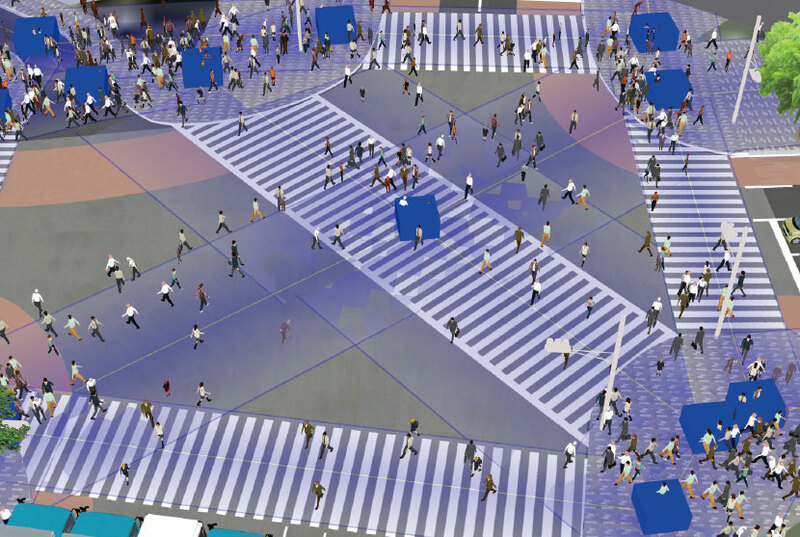 The simulation mode has been added. 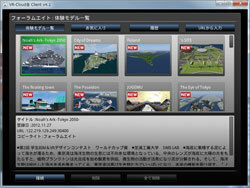 In this mode, users can practice the manual flight and test the flight plans without using actual drones. 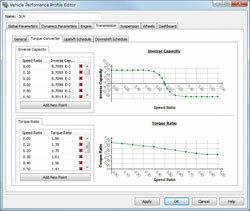 Users can now control the clients' viewpoint position data and the setting data of the camera sensor plug-in. 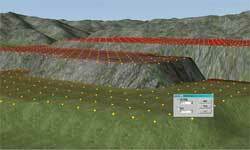 The geographical features are enhanced. 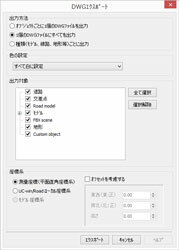 Using the "CGIAR-CSI SRTM 90m Database" for all parts of the world, geographical features of China and Australia are installed in UC-win/Road. 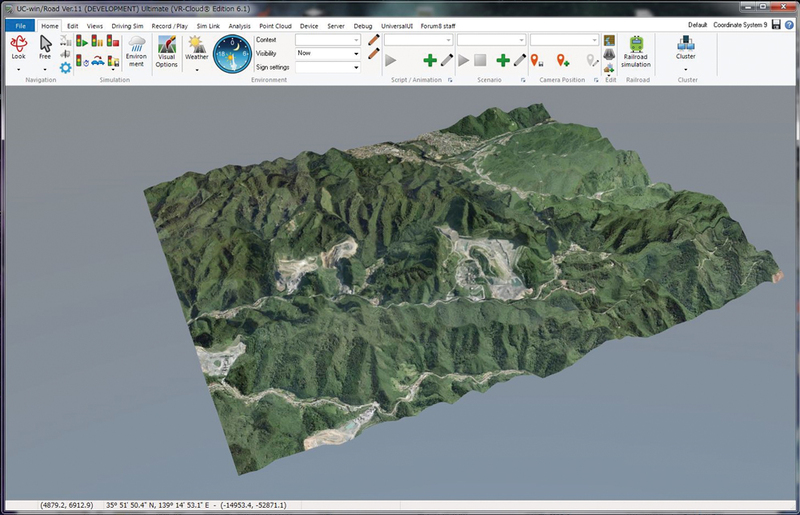 Highly accurate terrain can be created whilst specifying its resolution. 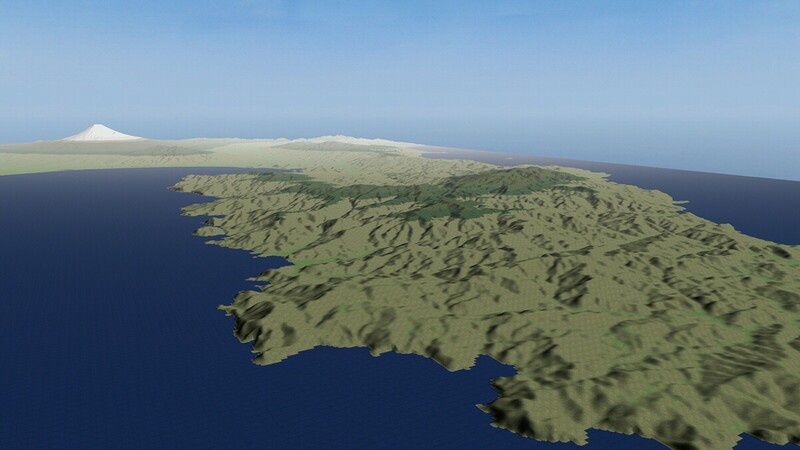 The large terrain exceeding 100km in area can now be generated. 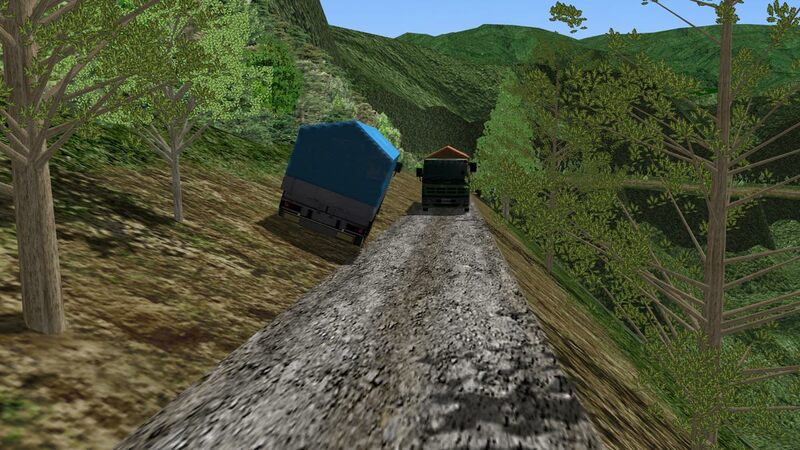 Deal with terrain matching processing in addition to cutting and banking by road generation. 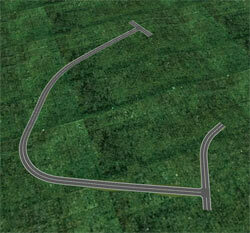 Simple circular curve (arc) has been applied in conjunction with the vertical curve (parabola) of a road. 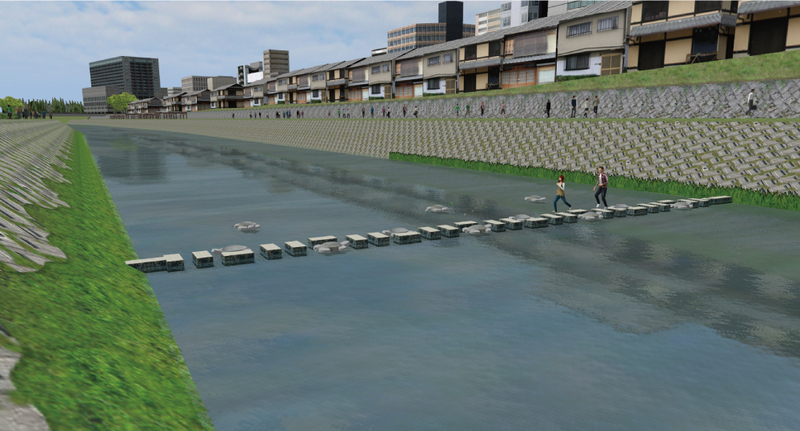 Planar and longitudinal alignment is now possible. section editor. 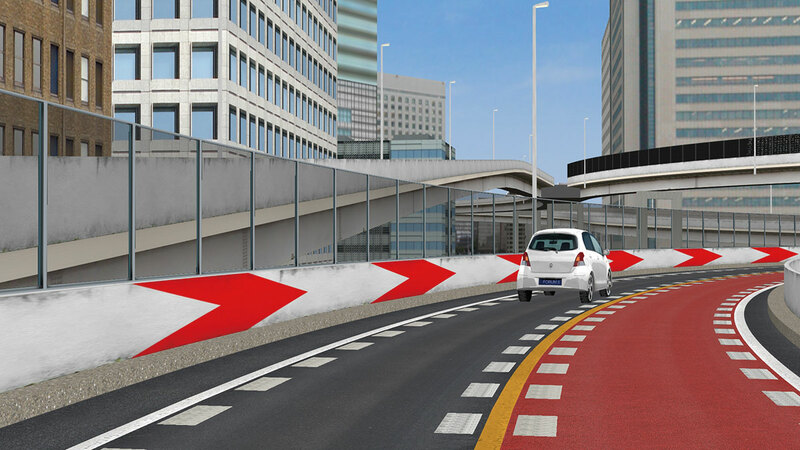 Transparency of transparent panels and translucency of a sound insulation wall or balustrade can be expressed easily. 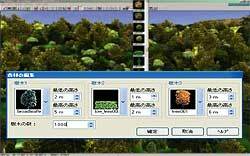 We have improved the setting method of cuttings and banks. It allows the setting of width, angle of slope and textures for each stage of the right side and the left side. 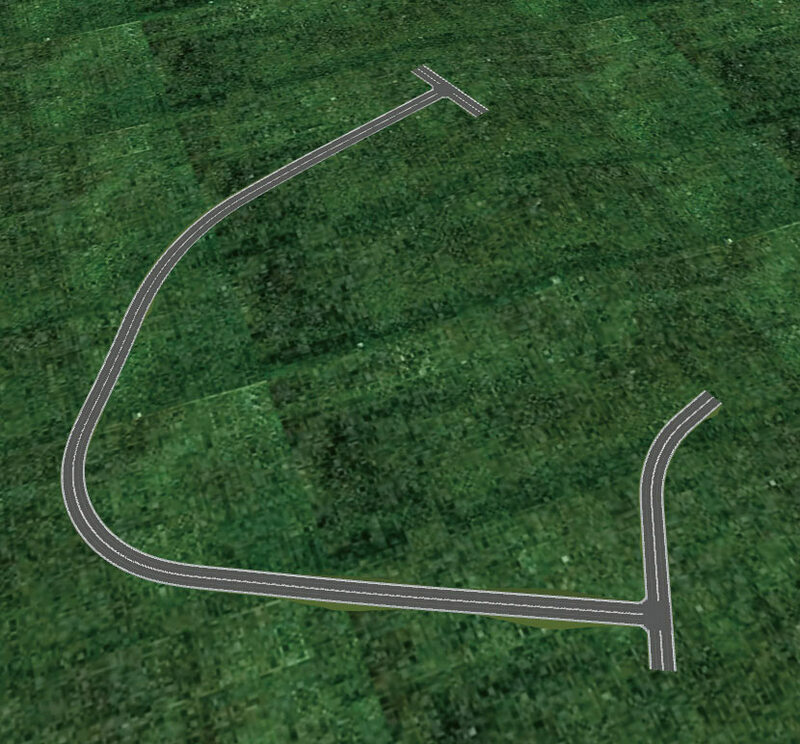 The rounding can be set for the berm. This feature allows the automatic generation of between several hundred and several thousand trees at predefined locations. Collective deletion is also available. 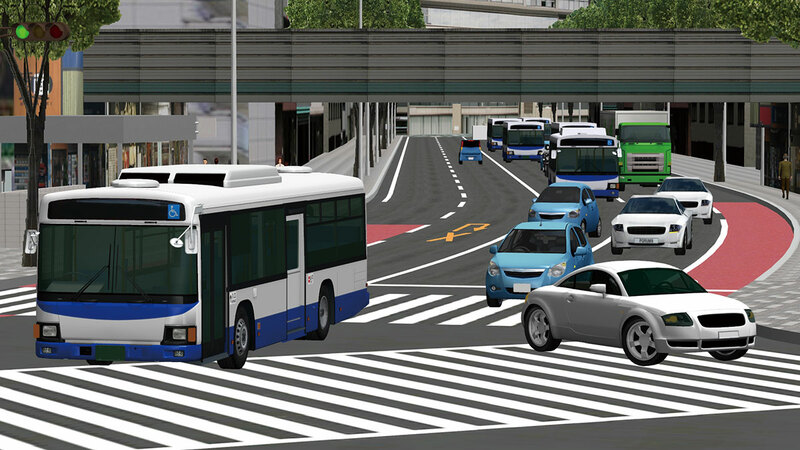 More intersection types including rotary and L type are now available for generation. 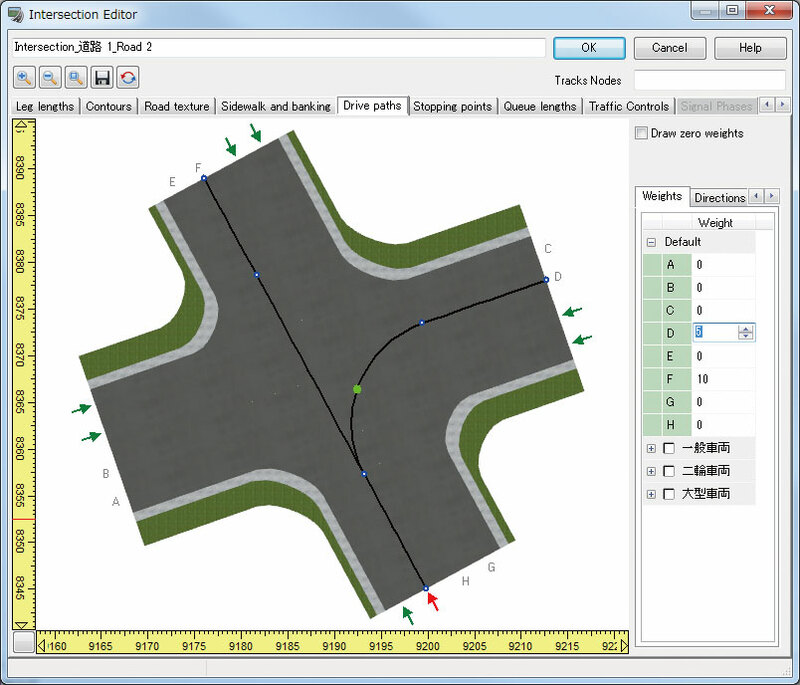 Complicated flat crossing and road signs are supported through 3DS output editing. 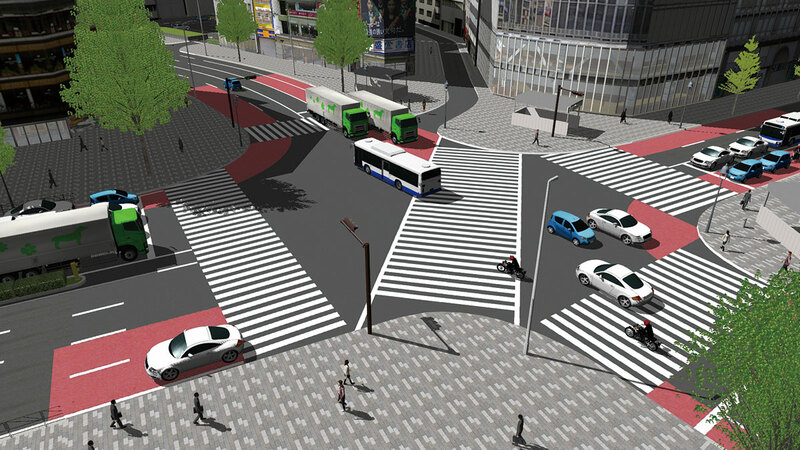 The improvement realizing for vehicles to run on the model at intersection was added. 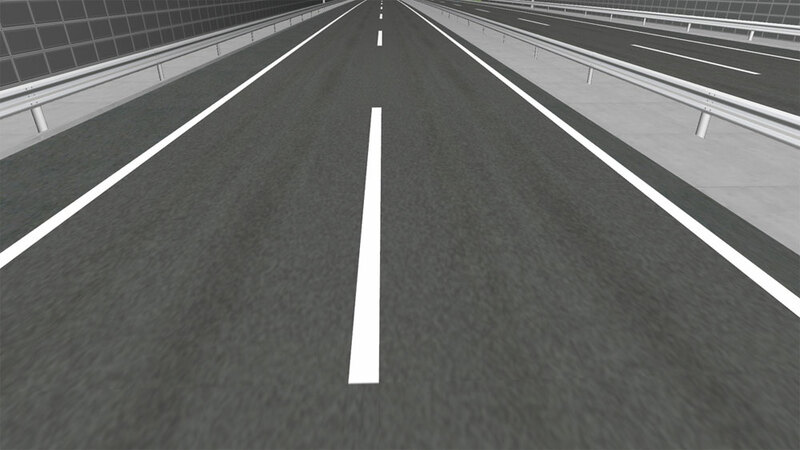 The function to generate road surface texture semi-automatically. 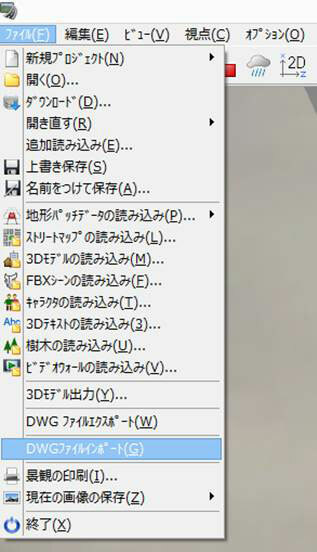 It reduces the work load of texture generation work. Generation and arrangement of 3D text on 3D space are available. 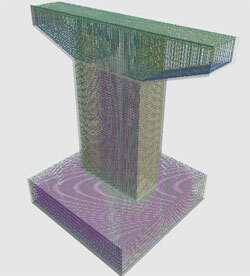 Animation video display including cylindrical screen can be reproduced as 3D object. Videos can be played on the curved surface. With this function, you can present various phenomena including fire, bonfires, stream from hot springs and smoke from chimneys. The visualization and movement of smoke and fire inside tunnels is significantly improved. 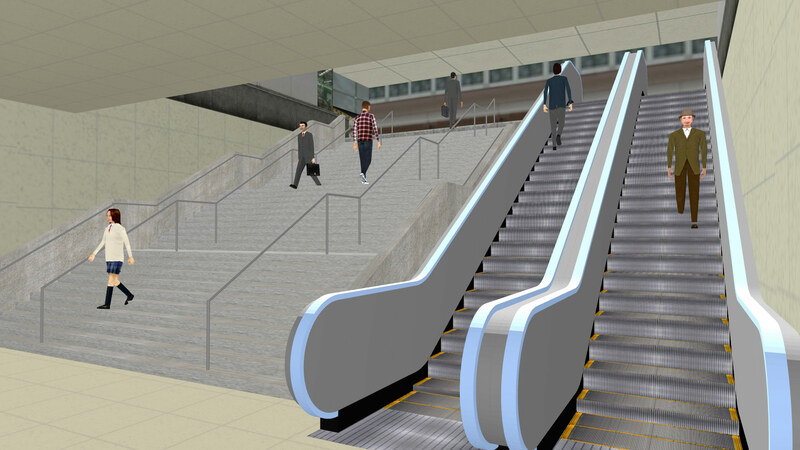 Sing, stairway, escalator, fence by parametric input can be generated. 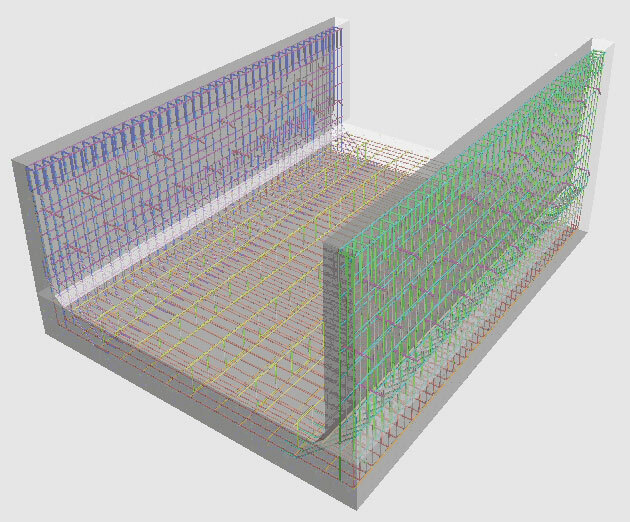 In case of stairway, the width, height, number of bars and texture can be assigned. 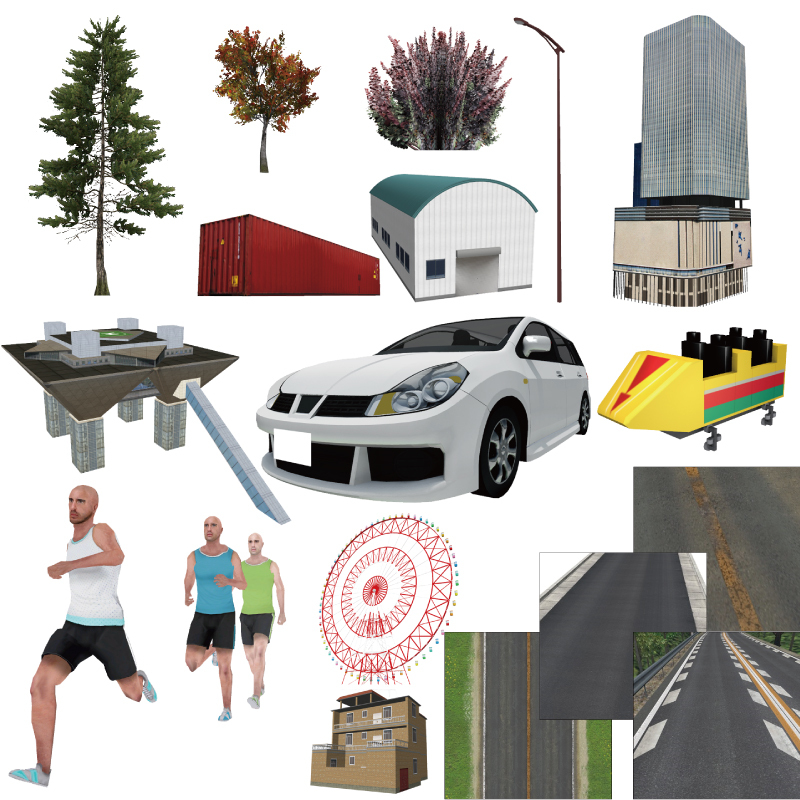 FBX file used for various kinds of models which have high accuracy is now supported. 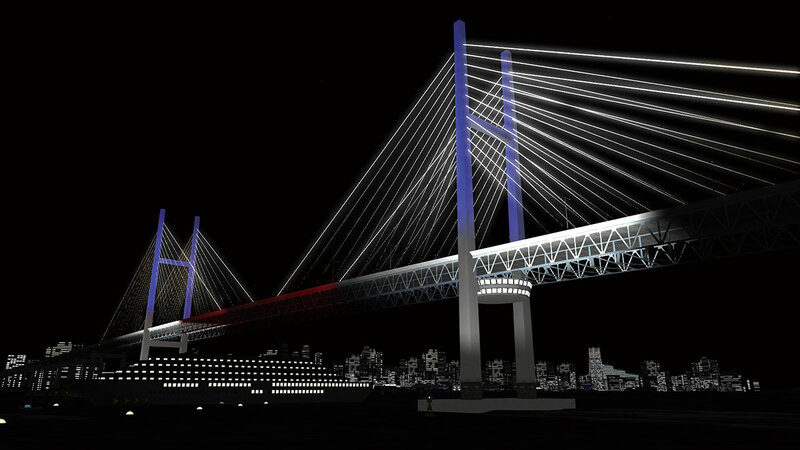 It supports the animation function using bone and allows to set the degree of transparency information and lighting effect and even to import Collada file including SketchUp etc. 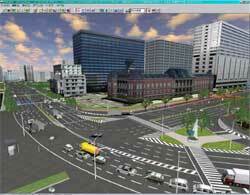 in traffic simulation are available. 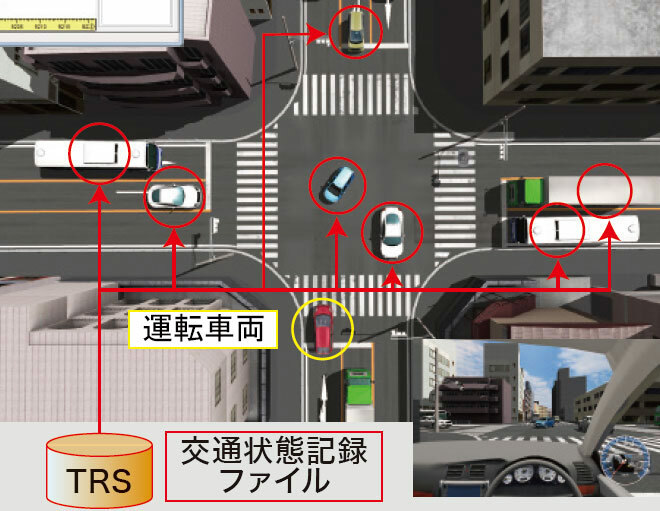 Traffic rules for Japan, New Zealand, China and Korea are loaded by default and moreover new rules can be added freely. 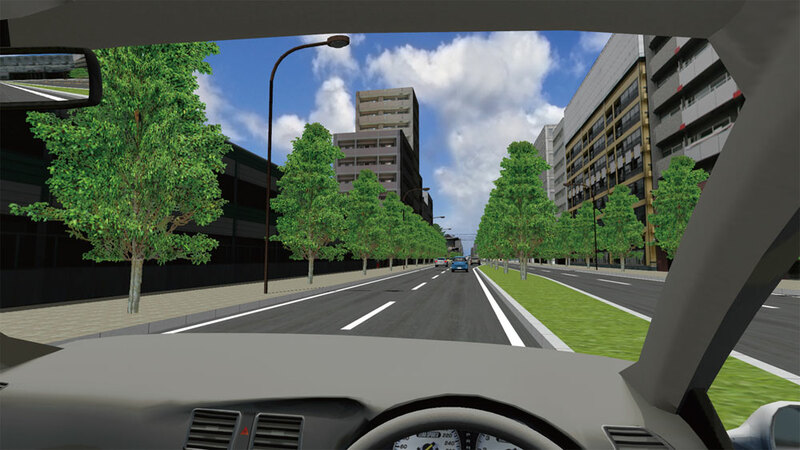 Users can drive vehicles around the 3D VR space using a steering wheel, a game controller or the keyboard in UC-win/Road. 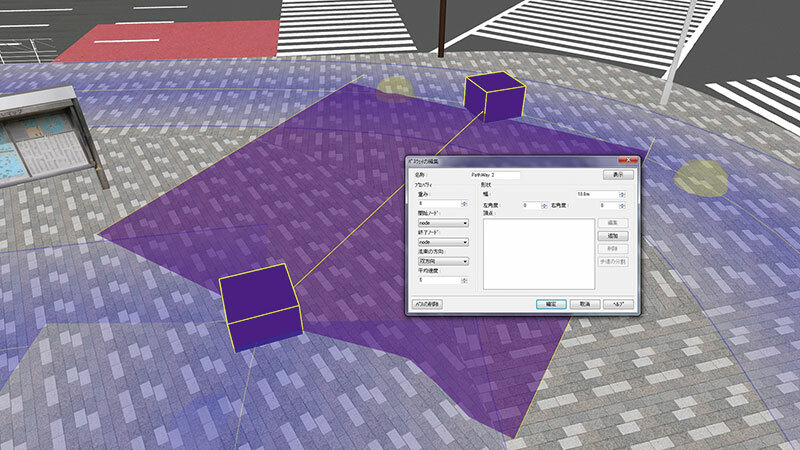 The virtual type which connects between moving nodes can be defined and the traffic movement can be set from edit window of plan view or main menu. 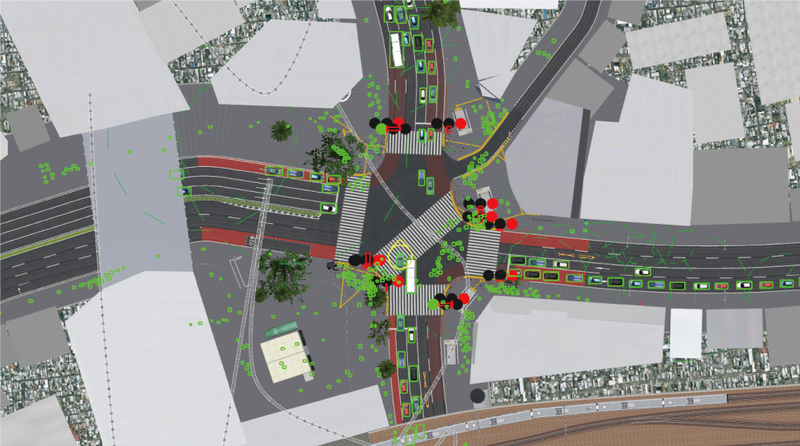 Configuration of driving routes, starting positions, running behind other vehicles (e.g. 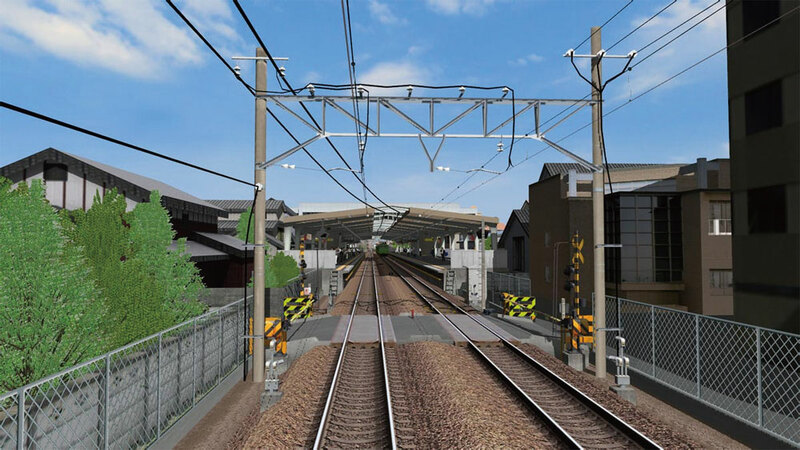 trains), sound configuration and railroad crossings, by setting action control points, is available. 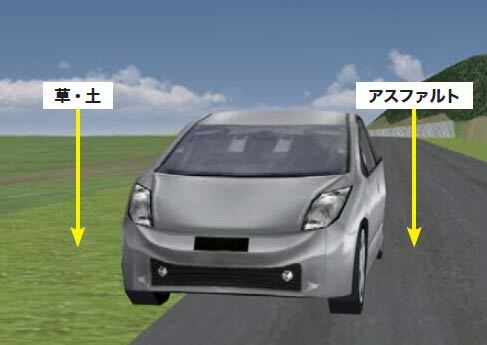 With vehicle plug-in, displaying revolving wheels and the steering angle is possible by defining the front and rear wheels. 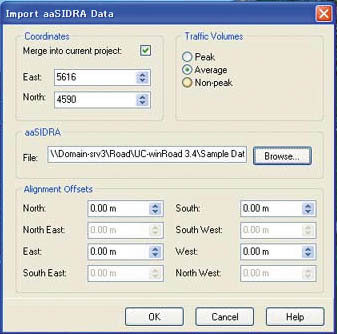 Visualization of traffic analysis reading the result of traffic analysis of VISSIM. 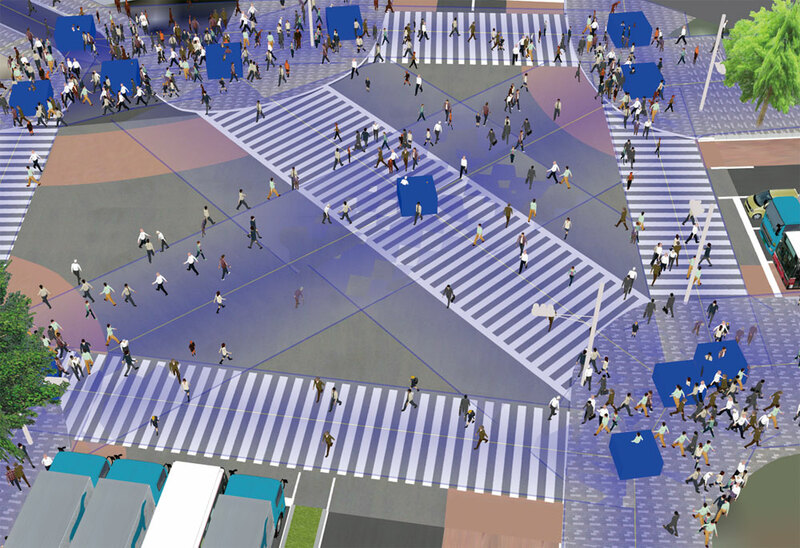 Dividing movement mode and simple viewpoint operation clearly, support the viewpoint operation in a movement mode. 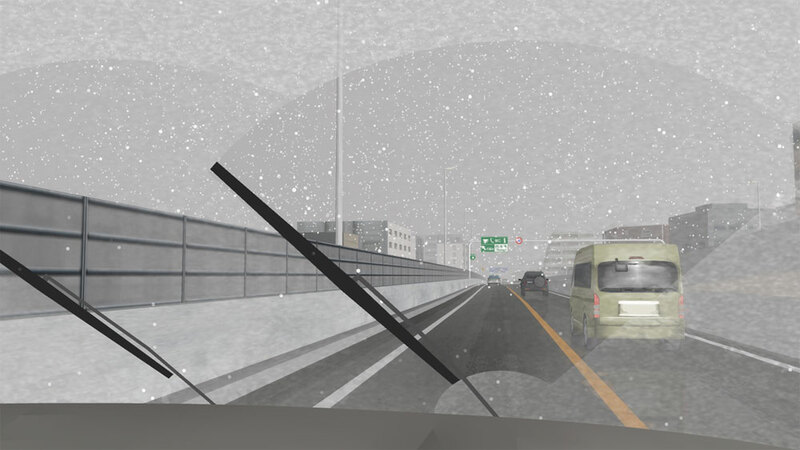 The function of rain and snow expression is lifelike. 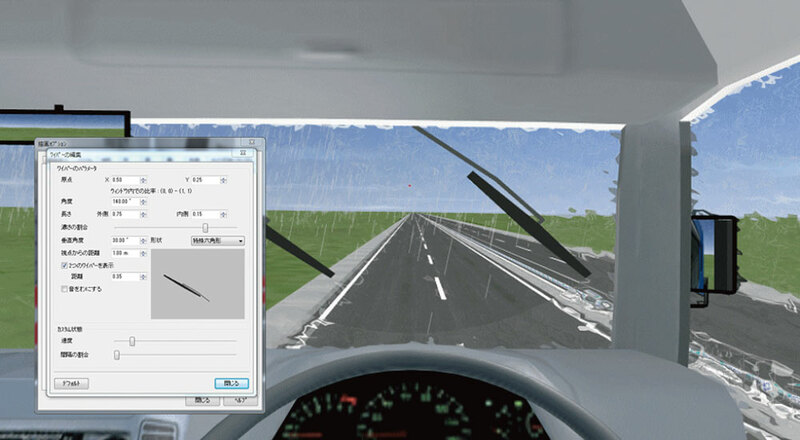 Fog, thunder, wiper(Can be operated with the axis of the upper surface of the windshield) and water splashing can specify the execution area. Speed alteration while walking is available. 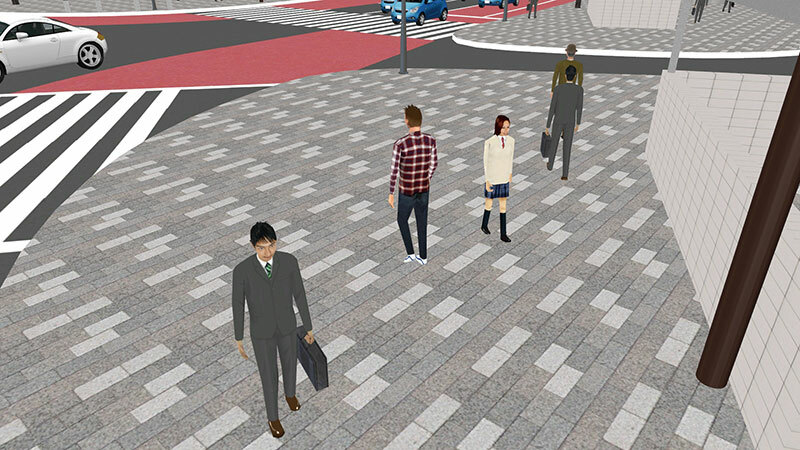 Walking operation with mouse was added. 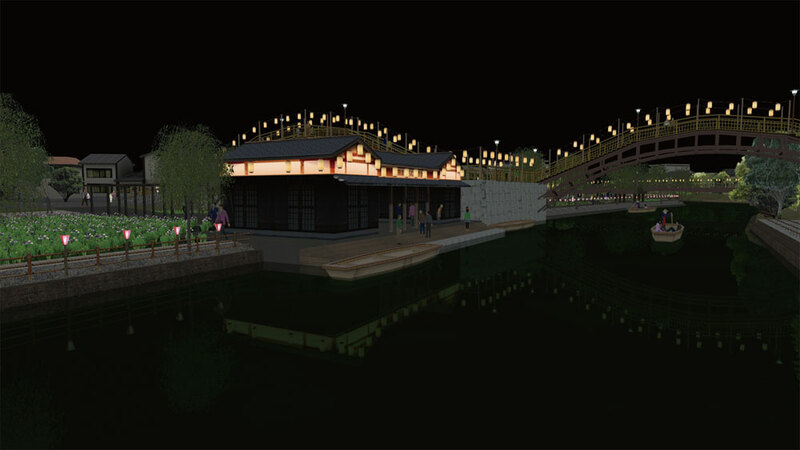 A simulated lighting feature is offered by alternating textures for day and night. 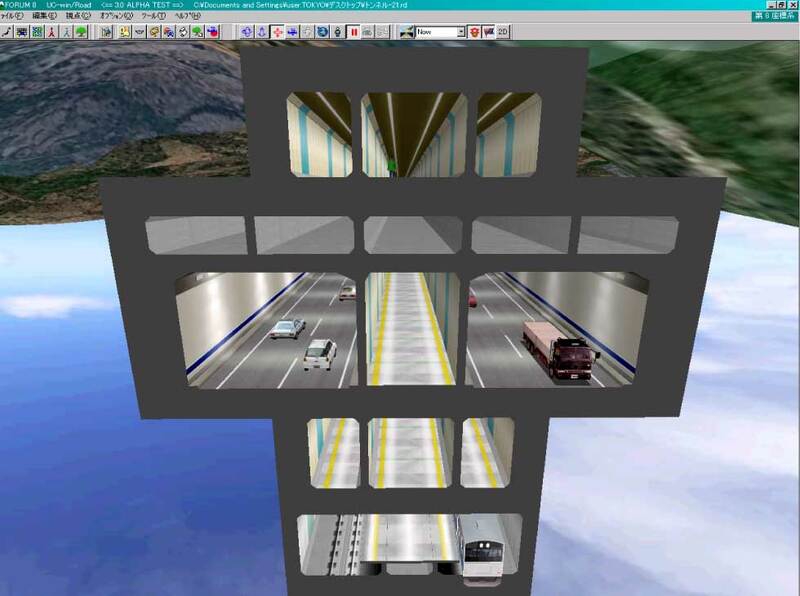 It will turn to night texture automatically in tunnel. 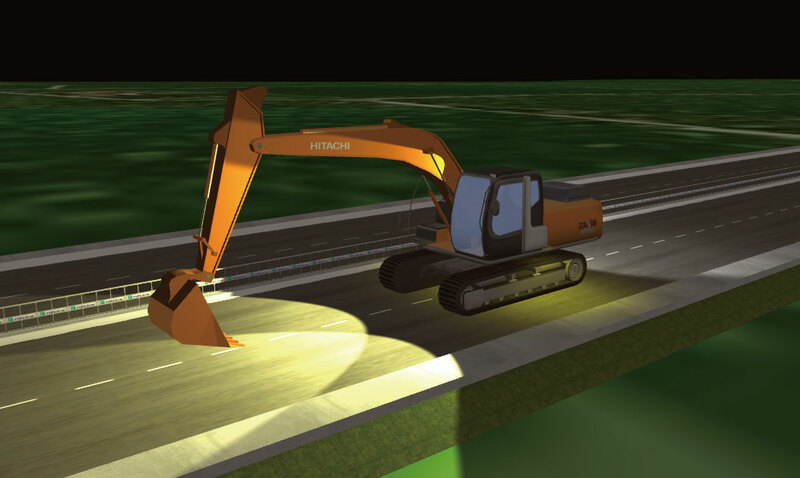 The spot light and head light gunction allows the simulation of night time and lighting. 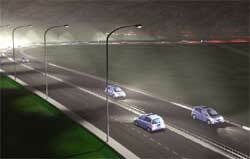 For instance, you can use it for a signal lamp a window lamp in a building or the light of a ehicle. Can be set individually for each vehicle. 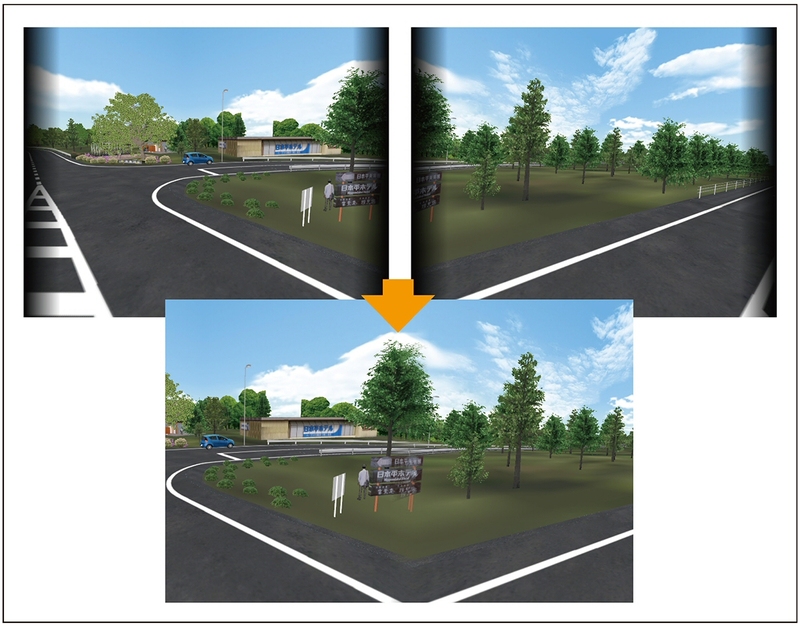 The range and shape forming an area of exposure to right and left headlight of has been optimized, hence it can now be visualized in a much more realistic manner.The ability to switch from low beam to high beam and vice versa. 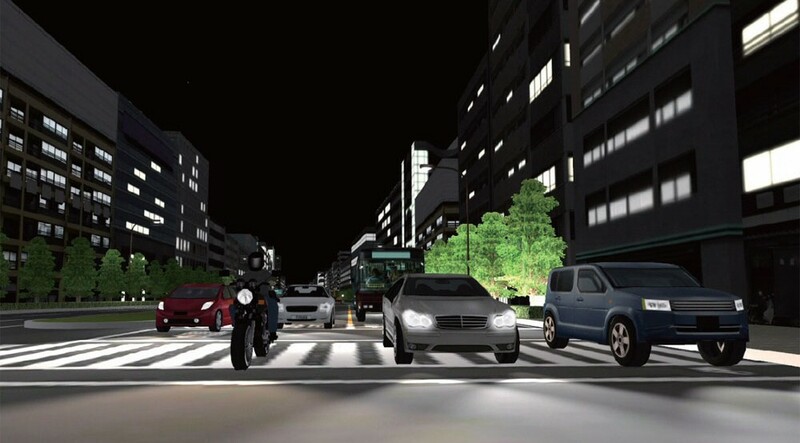 Visualization of light rays from fog lamp, reverse light, and the lights of special vehicles such as heavy-duty vehicles. 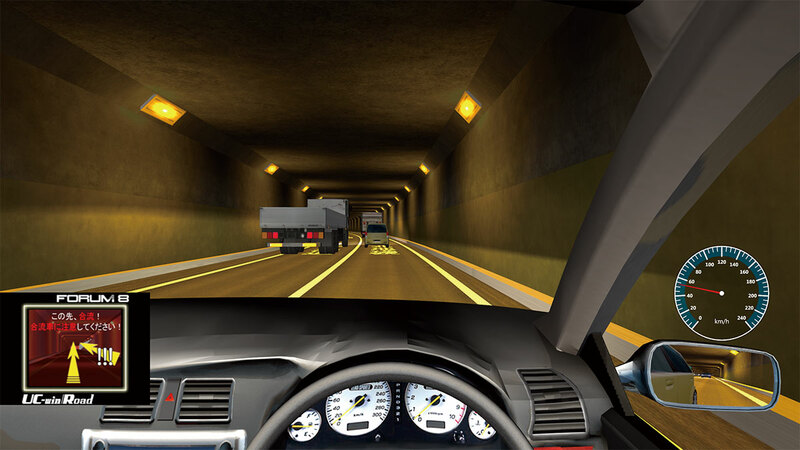 Setting the color and strength of tunnel lighting is available. 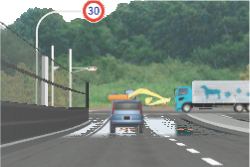 The effect is applied to the traffic vehicle going into tunnel and an adjunct of road. 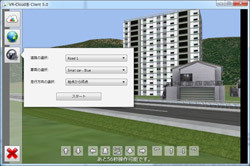 The function which can save various environmental setting in one context and are able to execute context in one click. Passive method which outputs the image to multiple screens with parallax, and Active method which outputs to one screen from side to side using Quadro video tip, produced by NVIDIA are supported. 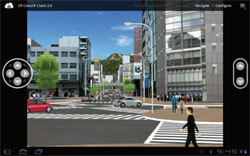 Wide-screen can be available. 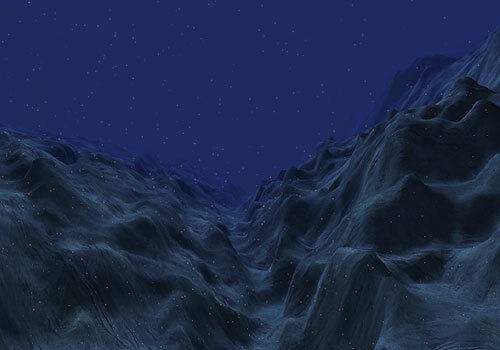 The Sky dome function is where the sky can be rendered inside of the 3D environment. 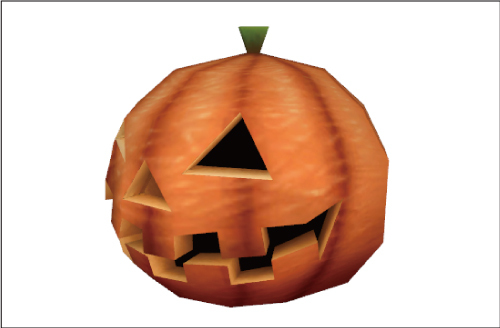 It is now possible to map various textures on it. Sky condition according to time and water reflection can be automatically created. 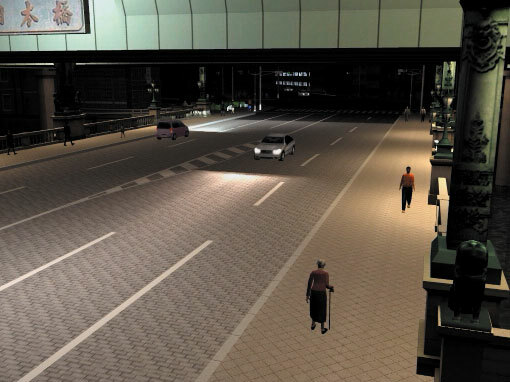 Performance and quality of the shadow rendering are also improved. 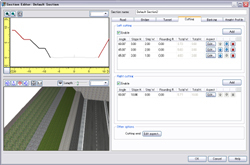 Support for manual driving as well as traffic flow based on vehicle performance by vehicle type. * The manual driving requires steering controller (steering wheel and accelerator) that is sold separately. 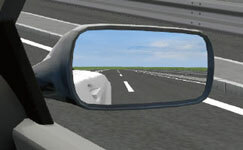 Side mirrors, the rear-view mirror (rear view) and car navigation system (display any view) can be displayed in real time. The cockpit of a large truck and heavy vehicles etc. 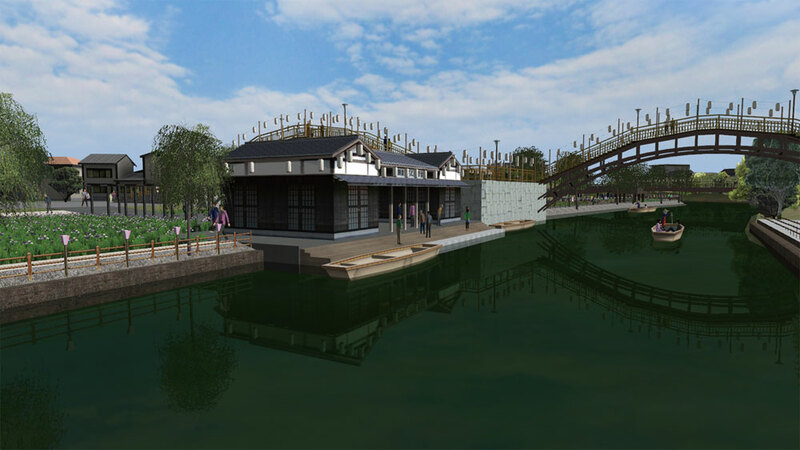 can be set to the mirrors as many specified parts as you want. 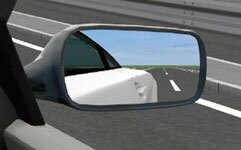 View point and view angle of rearview mirror can be adjusted. New mirror can be added. 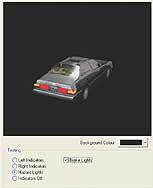 Types of describable car lamps have been expanded, and you can describe and control rear lamps, backlights, fog lamps, side lights, and 10 extended lamps in addition to current brake lamps, winkers, and hazard lights. 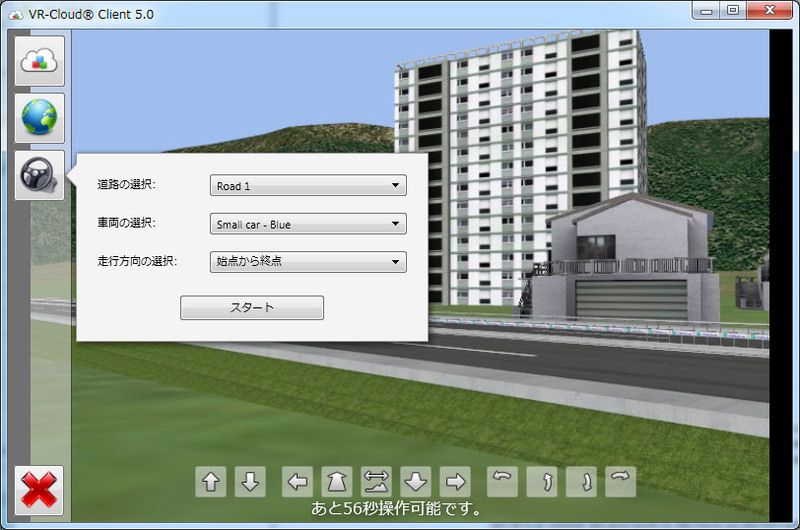 The Micro Simulation Player feature plays previously recorded motions for scenes that reproduction is required, but the following vehicle control mode will be added. Speed designation: Follows a specified speed strictly. 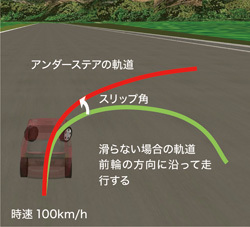 It can be applied to the travel in direction along the road and in any direction. 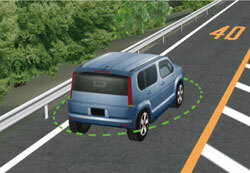 Acceleration designation: Follows a specified acceleration and deceleration strictly. 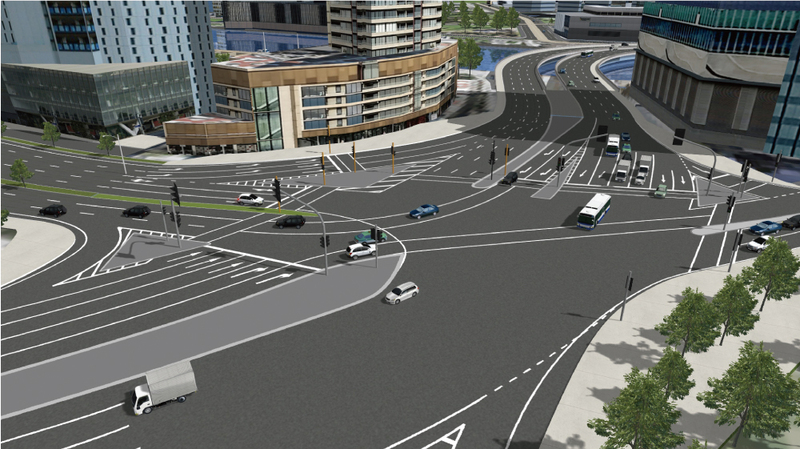 It can be applied to the travel in direction along the road and in any direction. 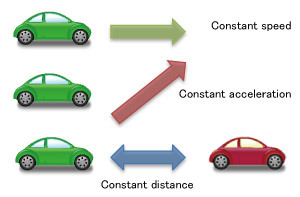 Keep distance between other vehicles: Travels while keeping the distance to the object vehicle. 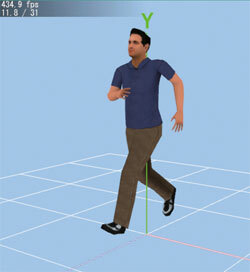 The expression of more realistic movement is now available by implementing model of overall. 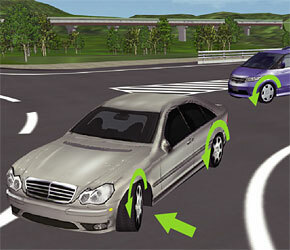 vehicle movements, engine and each transmission from engine to wheel. As vehicle dynamics model that accurately calculates vehicle's physics is included in UC-win/Road, it is possible to perform calculation taking into account the engine, transmission, vehicle weight and center of gravity, tire's frictional coefficient. 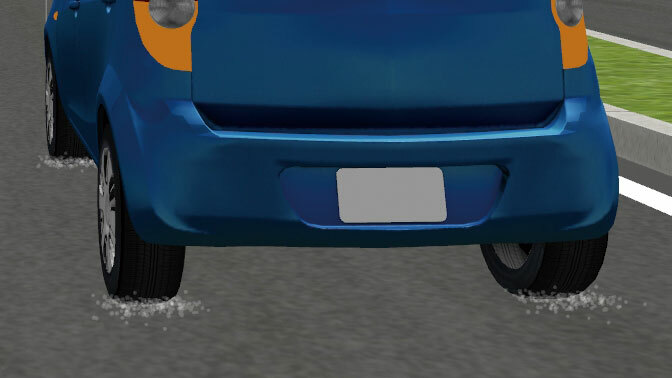 ABS (Anti-lock Braking System) is now supported. Significant improvement in that the characteristic of torque converter, which tranfers rotating power from an engine to the transmission, are modeled very precisely in car with an automatic transmission. 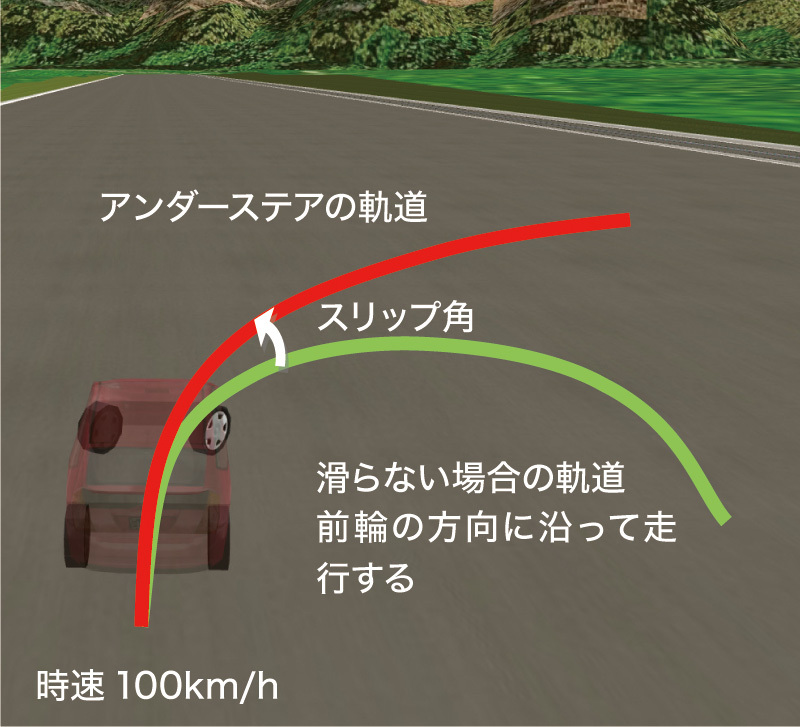 The concept of half clutch control has been added. 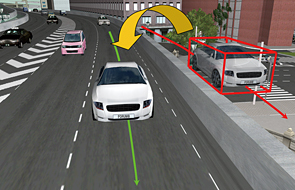 ACC function and self driving function in driving simulation are added. 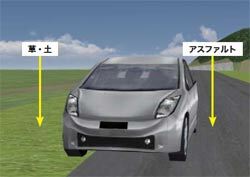 It can switch the manual driving and automatic driving. 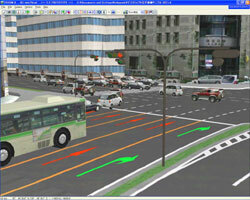 It also allows to recognize the traffic signals and limited speed. In automobile R&D, it is common to run simulations of automobile and its equipment at regular intervals. 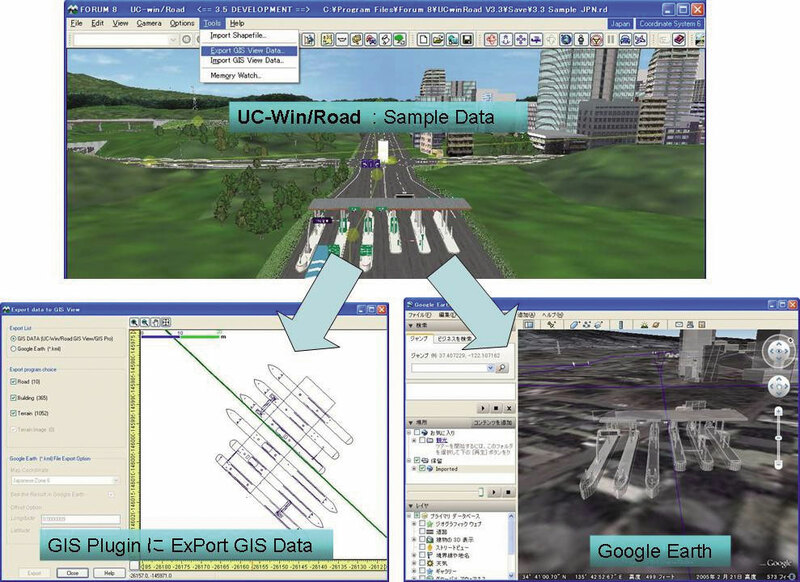 Until now, UC-win/Road synchronized visualization and simulation calculation, and performed them at the same cycle, depending on the PC's computation power. Cycle was variable according to VR data contents. 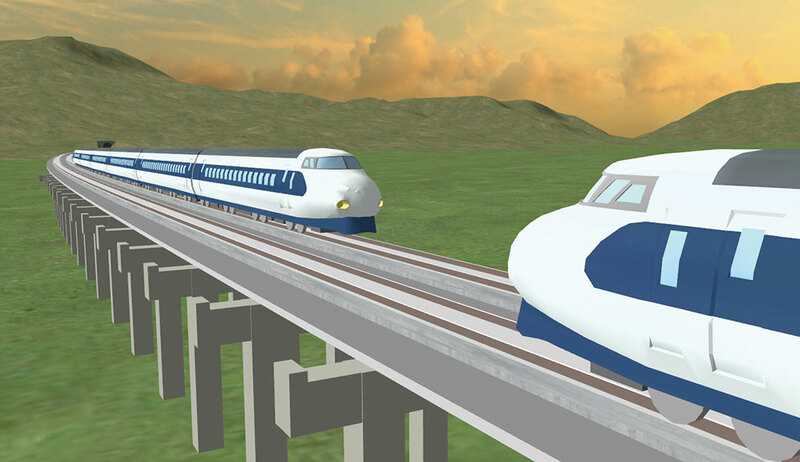 It could run simulations flexibly regardless of the kind of used content, but it was difficult to calculate in the accurate frequency. 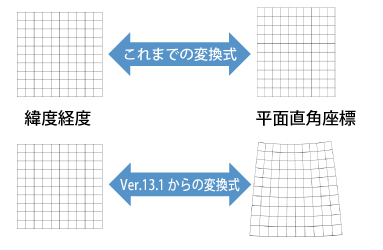 In UC-win/Road Ver.12, the calculation cycle and image update cycle can be set separately. A variety of patterns are available according to user's simulation needs (calculation and display, calculation only). Each combination and its purpose of use is shown in the following table. Internal timer can also be customized with SDK. 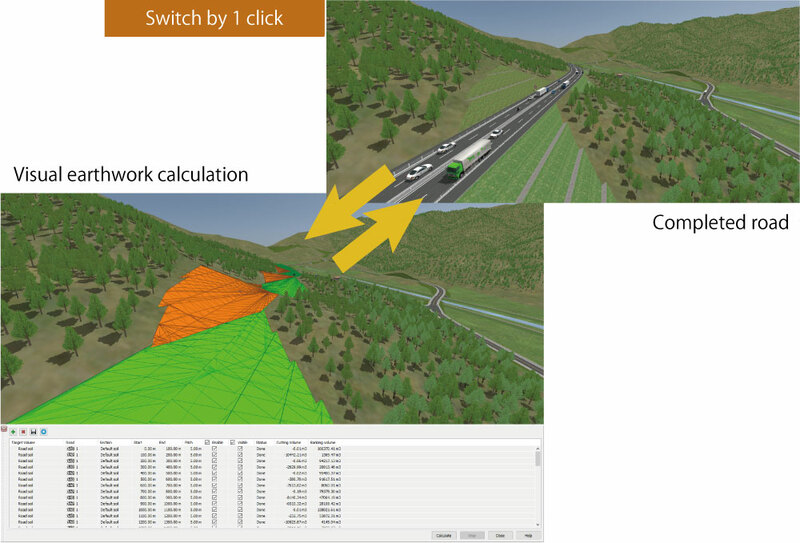 Applied ON - Synchronize calculation and display along to the real time. Frame rate is variable according to their burden. 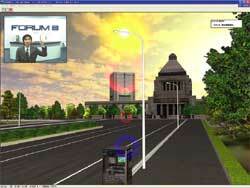 Applied OFF - Along to the real time, FPS becomes high depending on the CPU performance in simulation calculation. 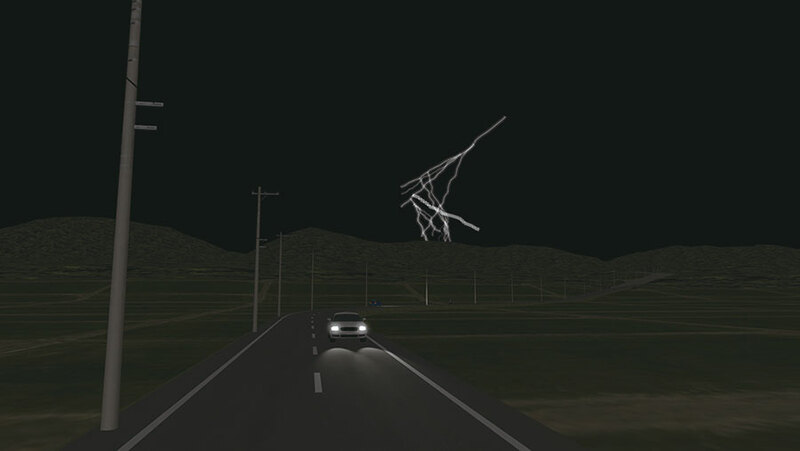 Display depends on the computer performance, and lower FPS than the simulation calculation is used. 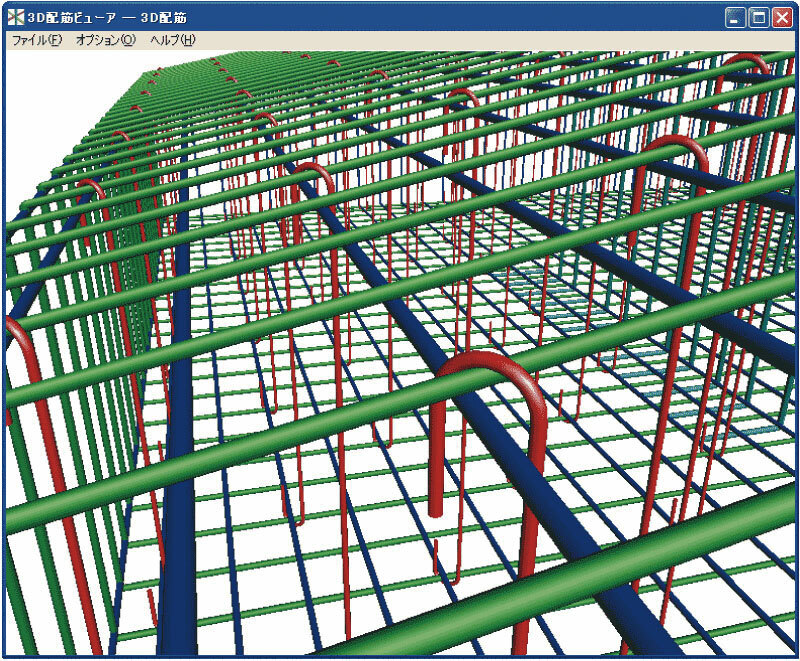 Fixed ON ON Simulation calculation rate is fixed and all frames are shown. Execute along the real time if at all possible (it will be slower than the real time if burden is heavy). 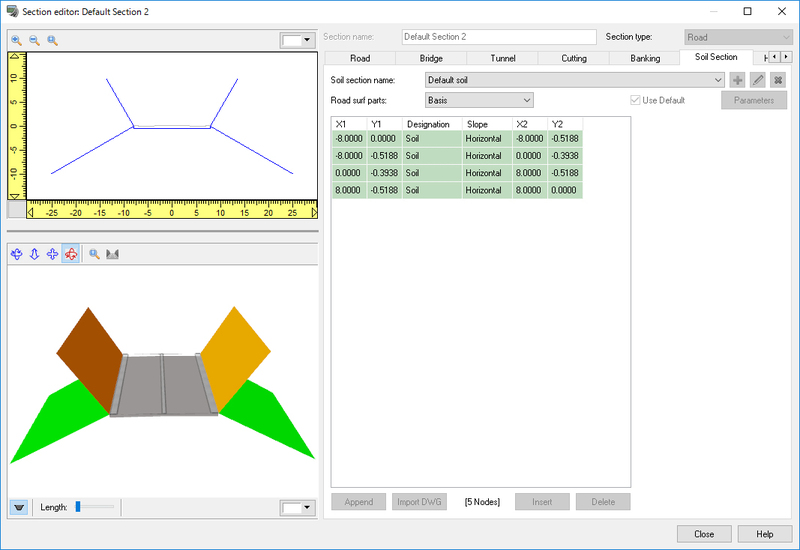 Fixed OFF ON Simulation calculation rate is fixed. Show only frames that can be shown according to its display performance. Execute along the real time if at all possible (it will be slower than the real time if burden is heavy). Fixed ON OFF Simulation calculation rate is fixed and all frames are shown. FPS becomes high depending on the CPU performance (not consider the real time). 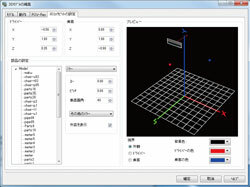 Fixed OFF OFF Simulation calculation rate is fixed. FPS becomes high depending on the CPU performance (not consider the real time). 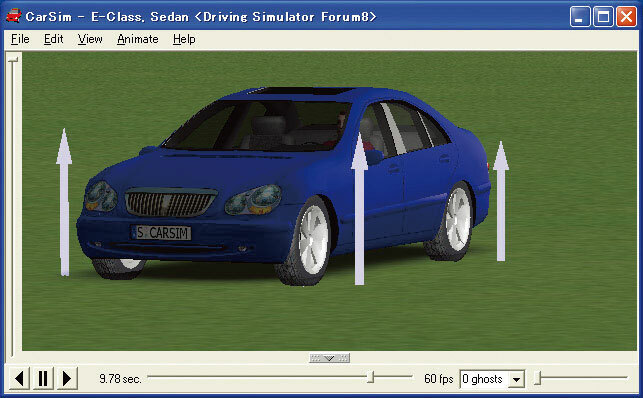 Display depends on the computer performance, and lower FPS than the simulation calculation is used. 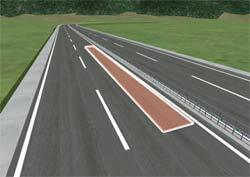 Setting the difference of friction coefficient on road surface in every texture is available. 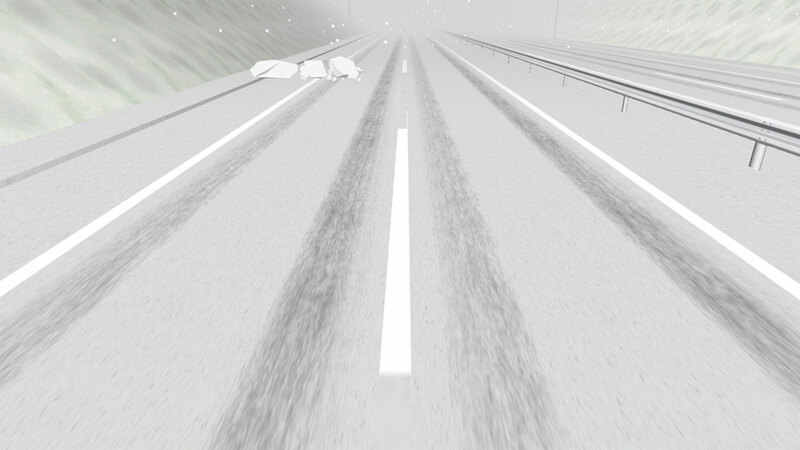 wind, tunnel reflection sound) are supported. Lowpass filter is supported. 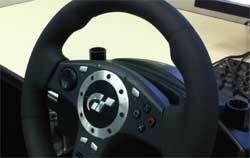 - Squeal sound (slip sound) and sound reproduction of 4 different wheels are supported. Automatic vibration deriving from road material and road shape and constant vibration within the area is transferred to the controller. 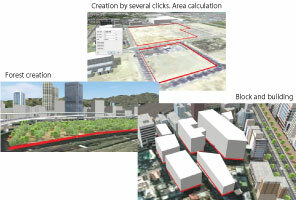 Calculates and draws visual volume based on the positional relation between the screen and the user. The viewpoint and view volume are updated by trackind the position change of the user with any device. 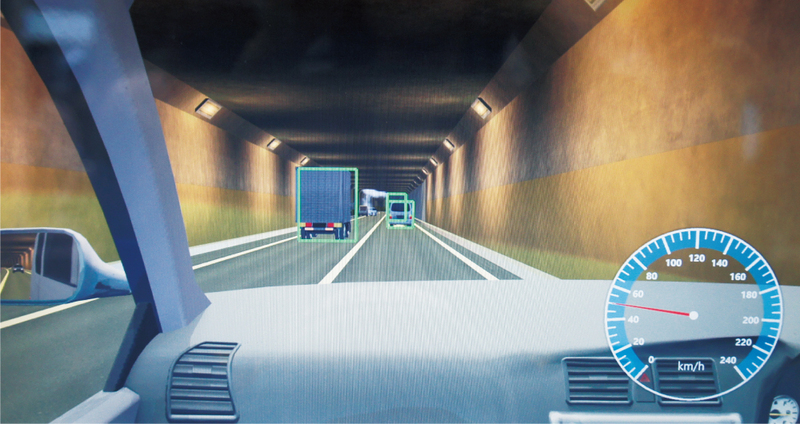 The head tracking function is a plug-in used for receiving a driver's eye position information while he/she is driving in real-time from sensors such as Kinect, and sending that information to UC-win/Road itself. When projecting via several projectors, the screen on the edges between the projectors can be smoothly displayed. Pitch angle of the projector is also supported. 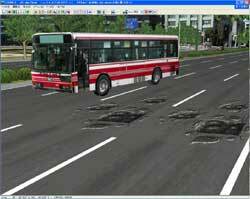 Version 8 is applied to the vehicle movement simulation using the set value of road friction coefficient Mu. 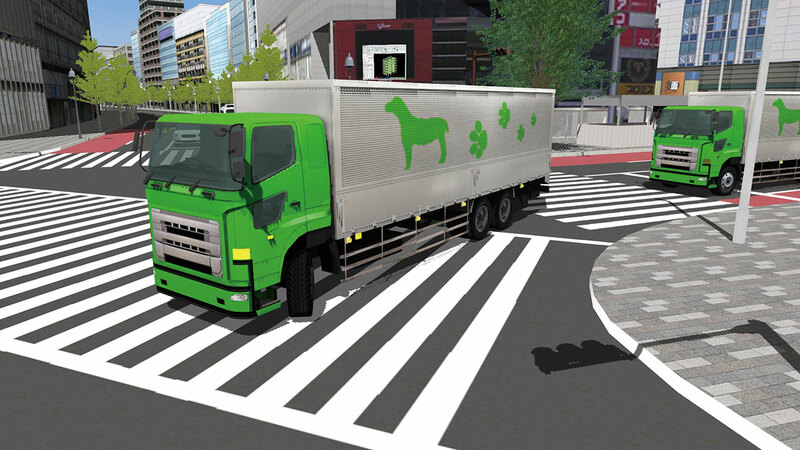 Cab model and trailer model are set separately, and they are controlled as different models are connected. Displaying full screen is possible, without showing the menu and tool bars. 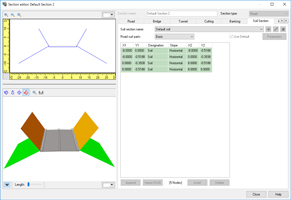 Simulation which can customize its panel position and command. 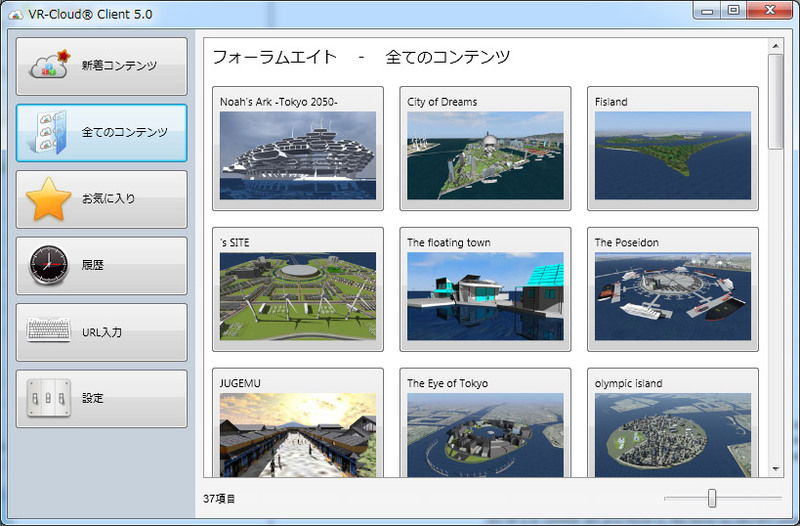 Ribbon interface is available. 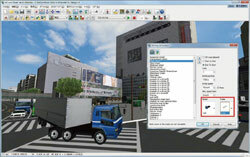 Frames and information of 3D models, roads, and vehicles can be displayed. 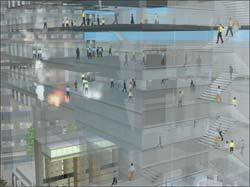 Simulation status can be seen at glance. 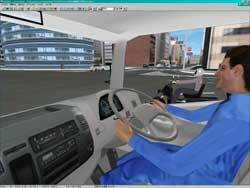 By using a 3D Mouse like "Space Navigator", you can move in the 3D space intuitively while using your mouse at a time. Operation via game controller and keyboard is supported. You can search and browse a variety of contents such as image, video, and web page by using a simple intuitive interface with 3D icons. 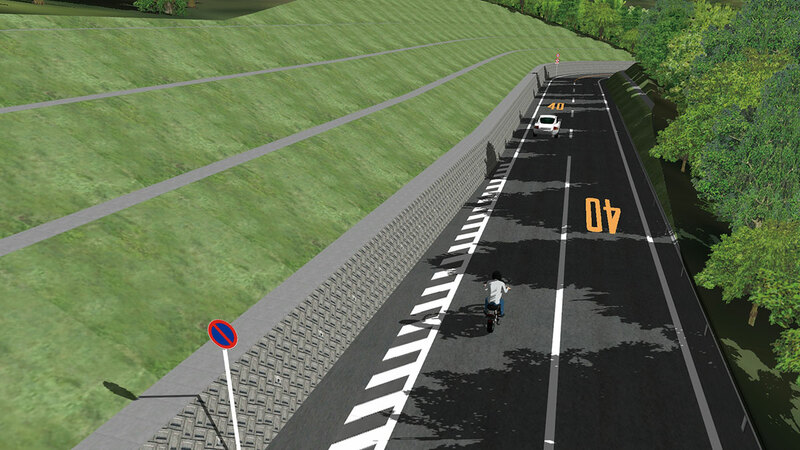 1.01.02 Switching from Japanese to English / lane changing. 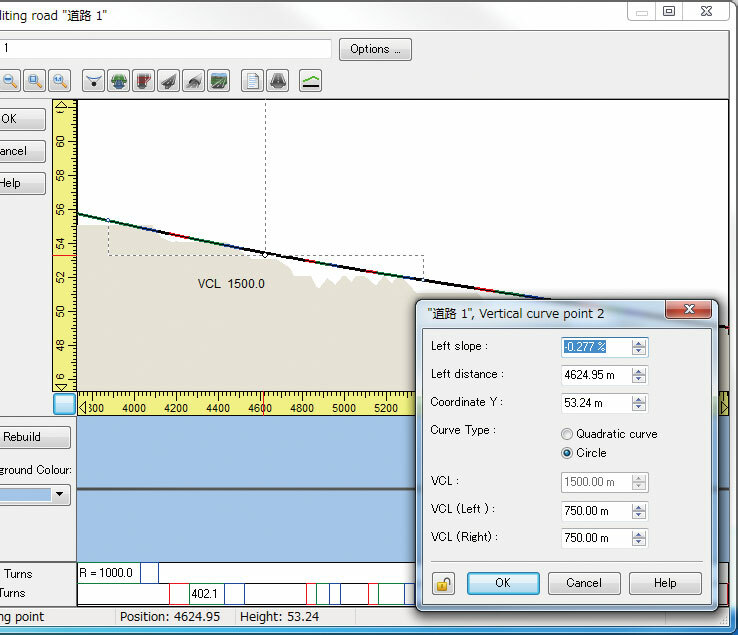 Editing function for elevation points. 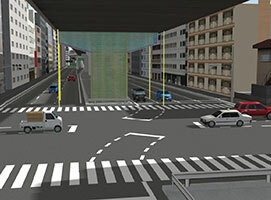 Shadow, rain, snow, wind, Level crossings, Custom terrain handling, XML terrain loading, On / off ramps, Flight paths, Satellite camera view, Locating models along a road, Street map extension, Driving on the right side of the road. 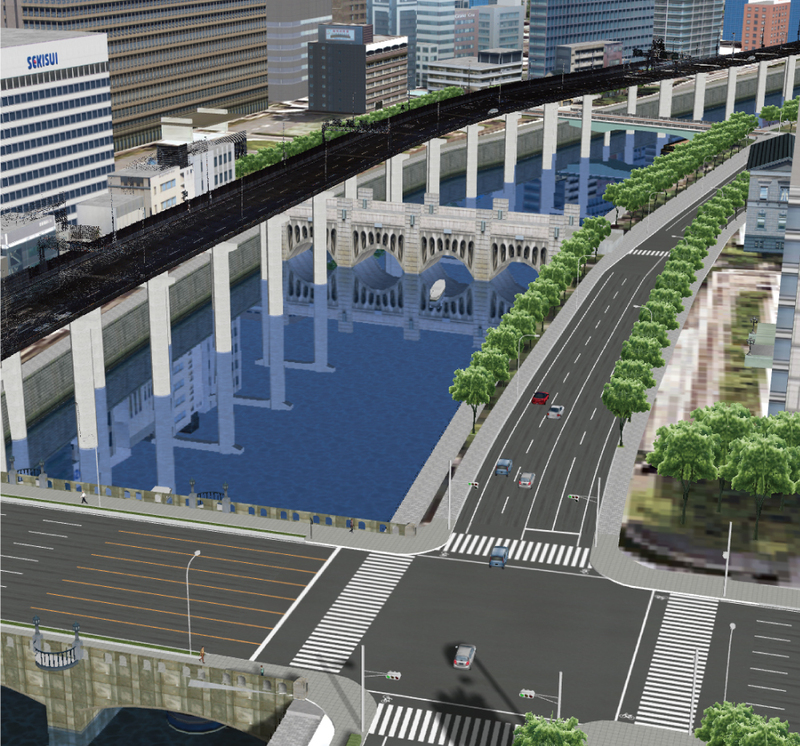 World geographic coordinate system, Movable parts for 3D models, Rivers, Road Marking, Power lines, Flags, Terrain transparency, Before / After, Joystick Control. 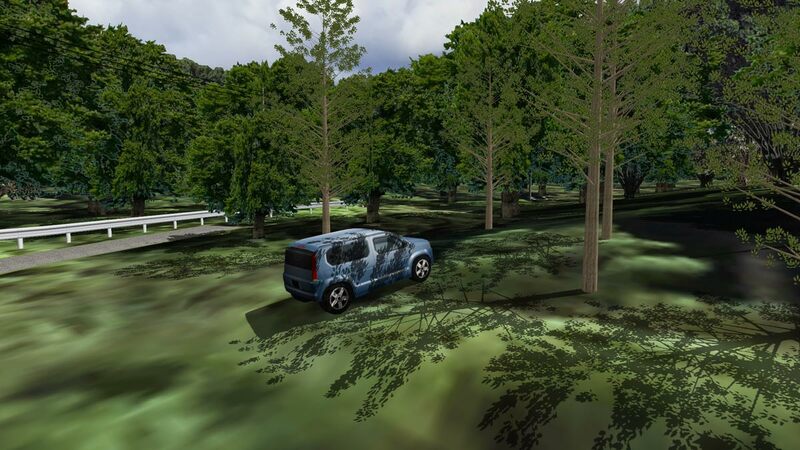 3D Tree Editing, Creating AVI Files. 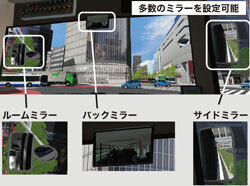 2D view window, Support for multiple monitors. 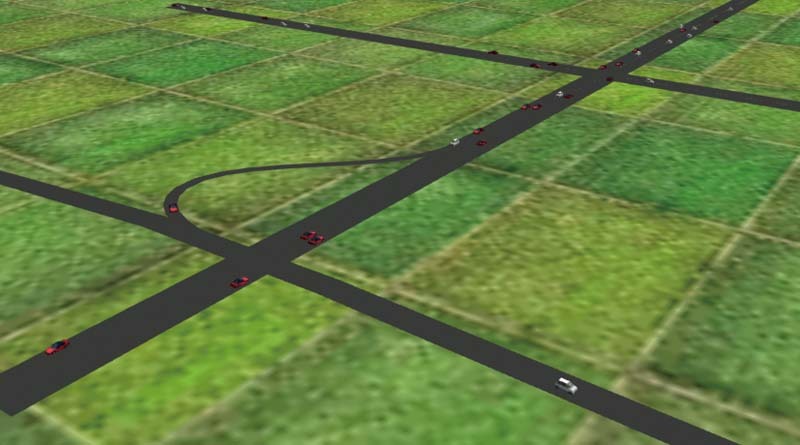 Traffic generation, Travel route, Lighting effect textures. 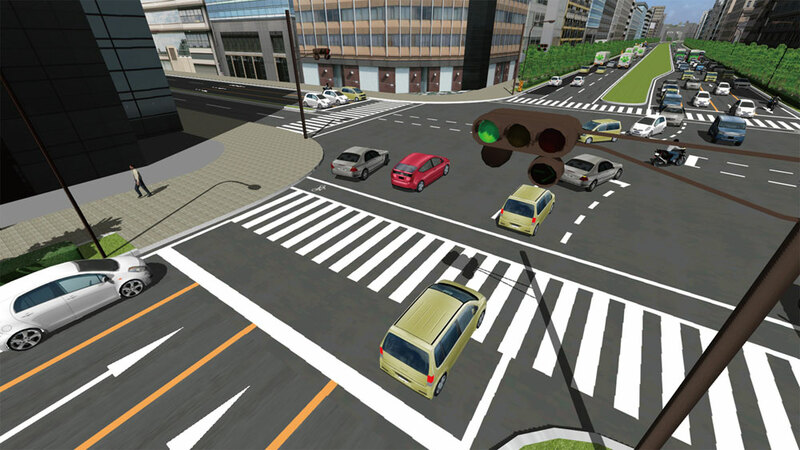 Traffic lights plug-in, Road obstacle plug-in, Indicator and brake lights. 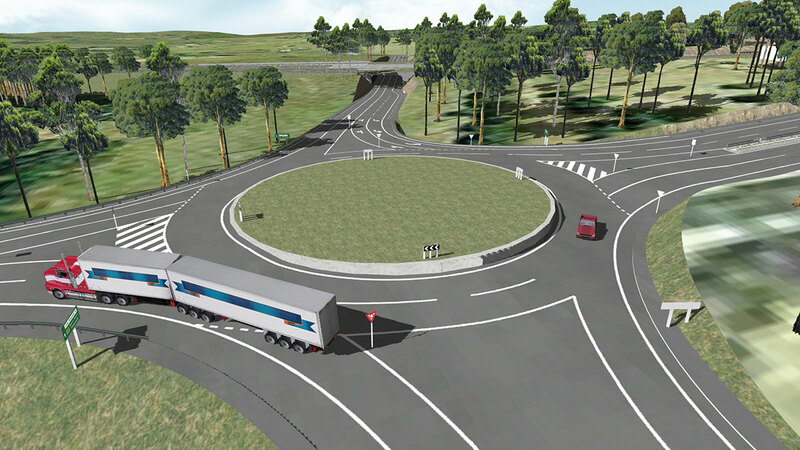 Drive simulation and cockpit, L-shaped intersection /roundabouts, POV-Ray, LandXML. 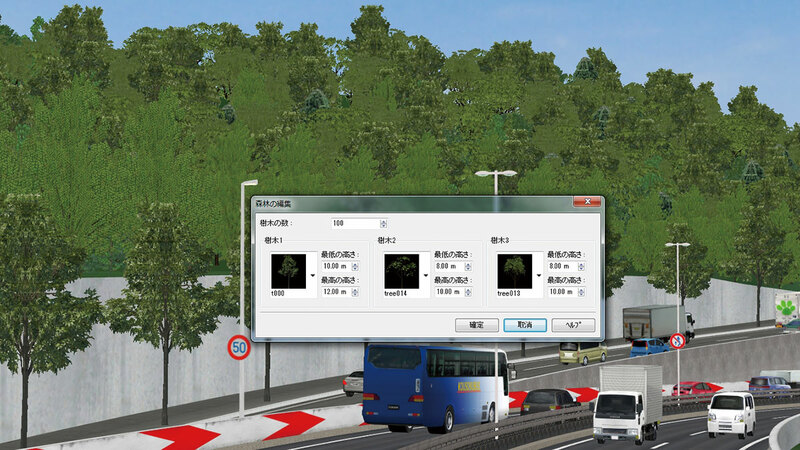 Support for French and Chinese (Formosan), Vehicle grouping, Vehicle appearance and disappearance, Vehicle queues, NZ terrain data loading, Multi view display, Tracks plug-in. 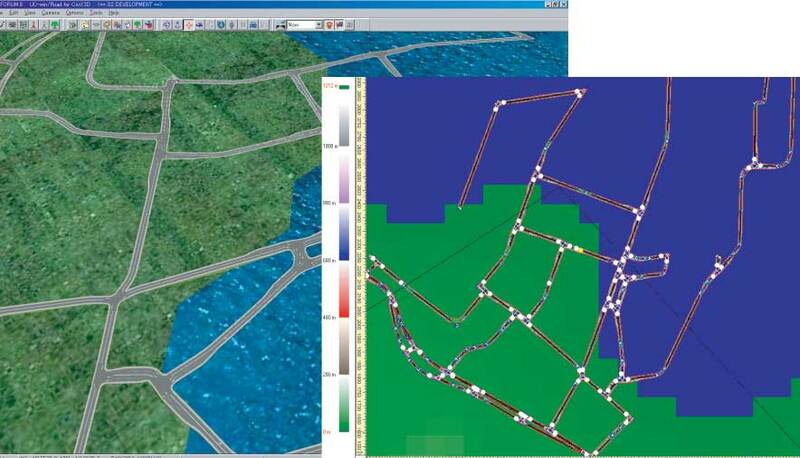 Drawing performance, Special weather and lighting, Import function of S-PARAMICS vehicle movement log. 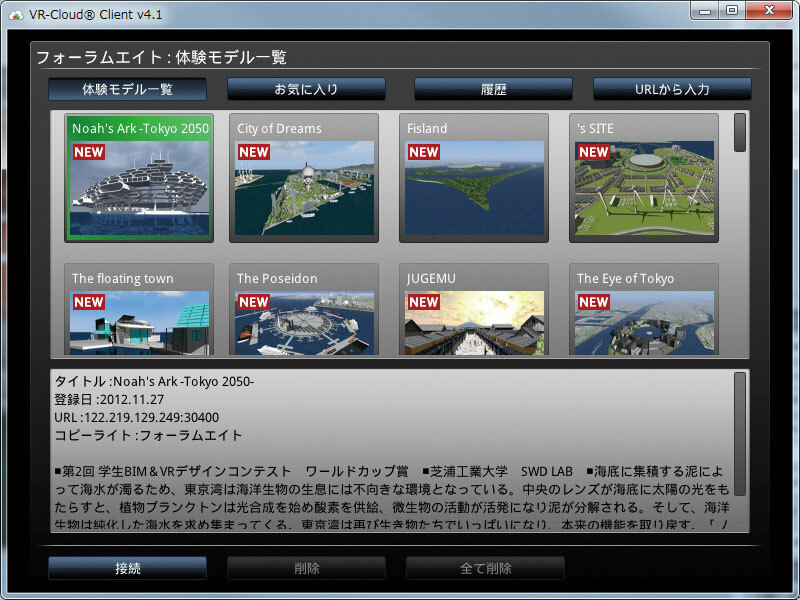 User interface and home menu have been updated. 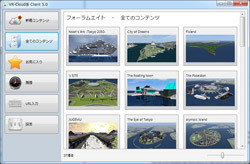 The cluster system supports multi-user simulation. 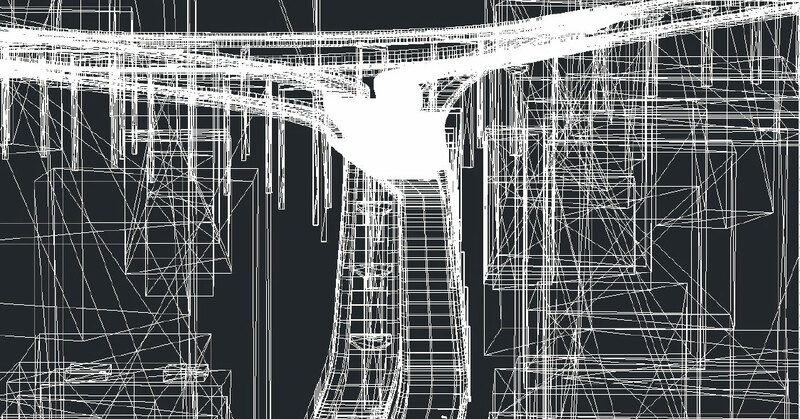 DWG Import/Export, Head Tracking. 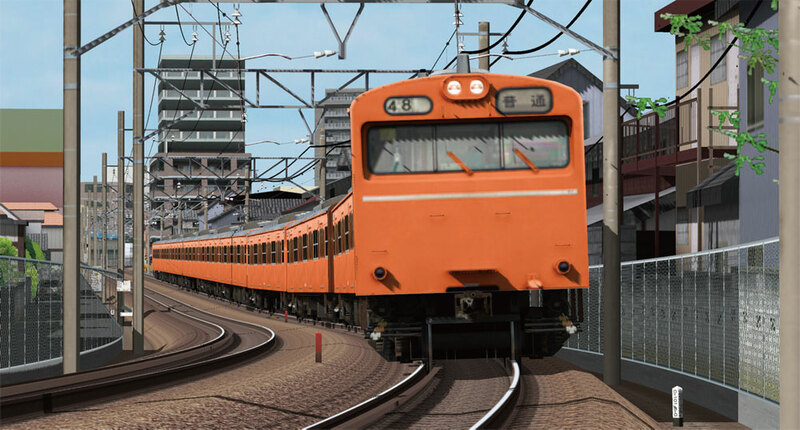 Update on Railway Simulation and Crowd movement simulation. 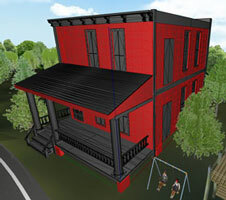 3D models can be selected, moved laterally, rotated, or deleted. Rhino Plug-in implemented in UC-win/Road Ver.10.1 is supported. 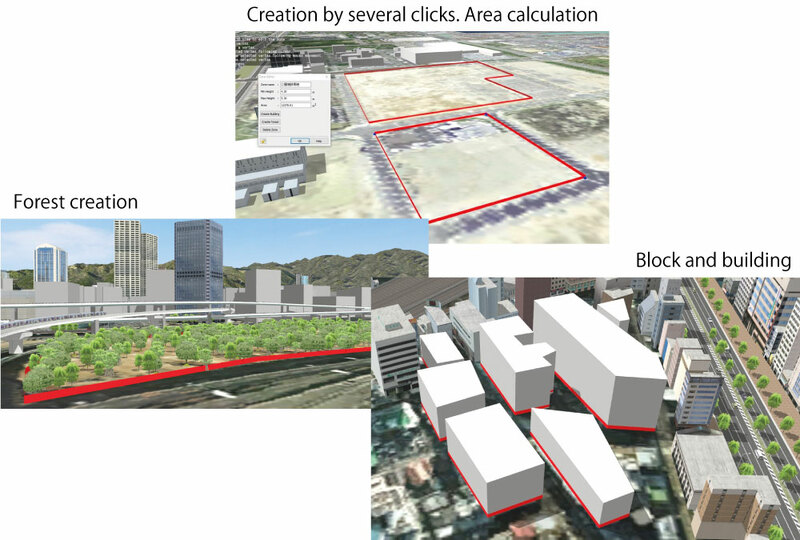 The terrain data and design and analysis data such as structures and civil structures designed by BIM CAD are linked with UC-win/Road so that they can be checked in VR space. 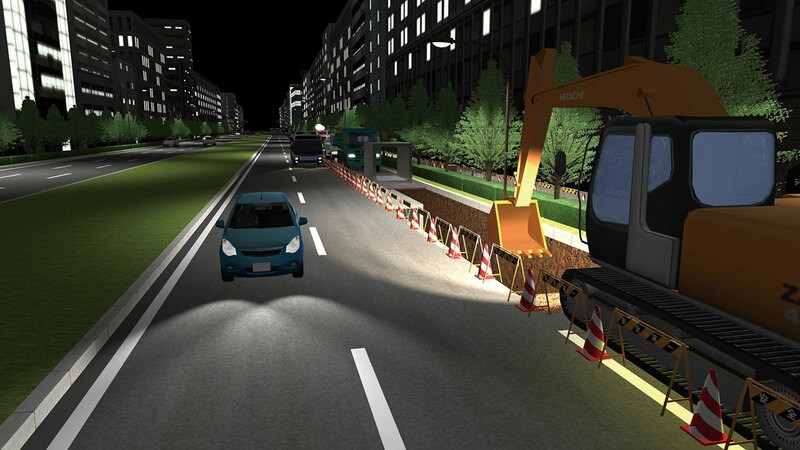 It is total integration system to allow you to design of civil engineering, such as road/land development, VR simulation, presentation by linking with Design CAD application and UC-win/Road. 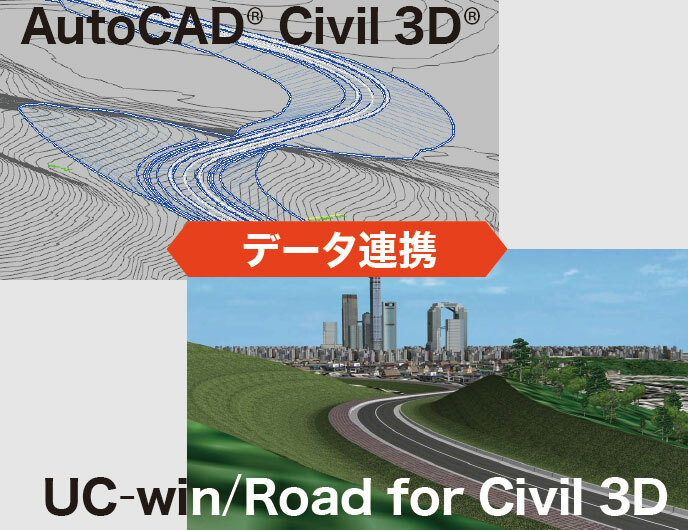 UC-win/Road can link at object level with Next generation solution "Autodesk Civil3D" which brings a paradigm shift to civil engineering design process. It has necessary function to examine the road alignment (road curve: clothoid curve), railway alignment (sine curve, cubic parabola) and can check designs and calculate coordinates. Moreover results can be output as an alignment diagram. 12d allows fast production in a wide variety of projects including mapping, site layout, road, rail and highway design, residential & land developments, and environmental impact studies. 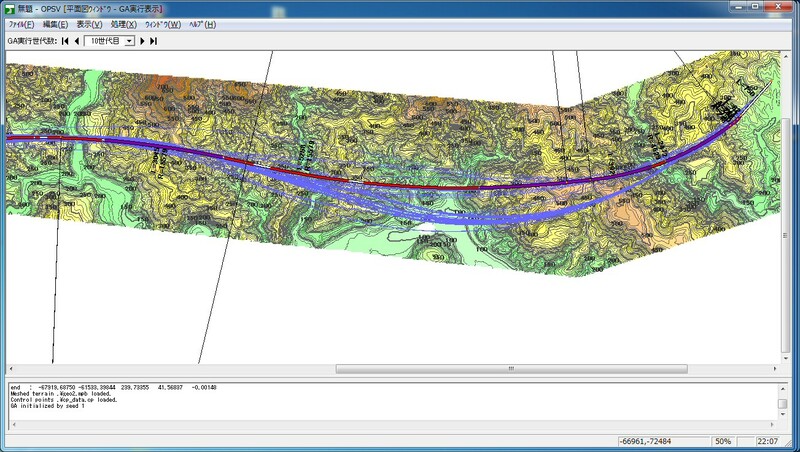 Importing data of UC-win/Road to 12d Model allows to calculate soil volume and create the detail drawing. 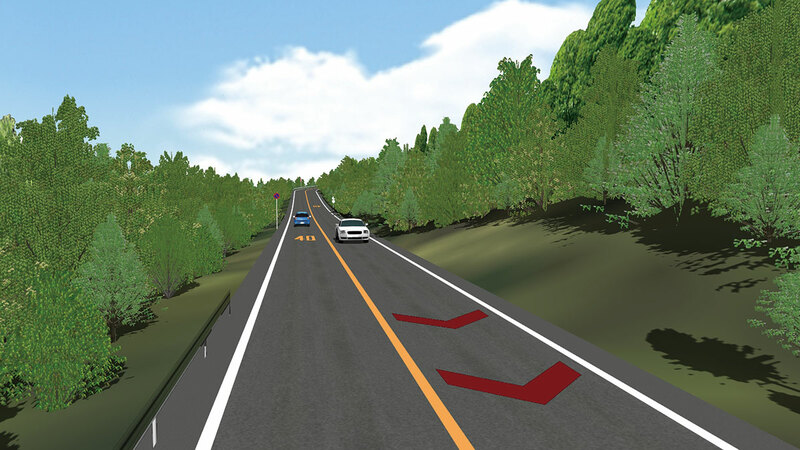 The optimal highway pass obtained by calculation can immediately be visualized in UC-win/Road thanks to its seamless linkage with OHPASS (Optimal Highway Path Automatic Search System). 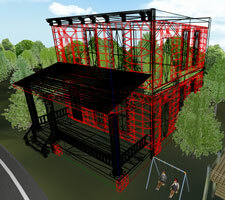 In cooperation with UC-win/ Road, confirmation of analysis result of OSCADY PRO in VR space of 3D is possible. 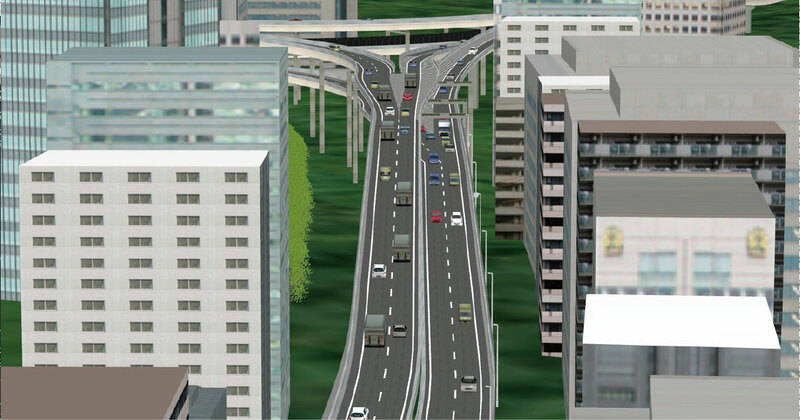 Specified format is provided from UC-win/Road. Vehicle position information is linked up with TRANSYT. 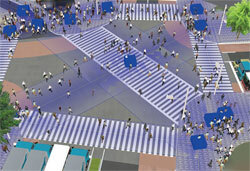 Public transportation, pedestrians/ vehicles are reproduced by dynamic traffic assignment technique. 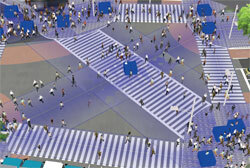 are cooperated in mutual directions. 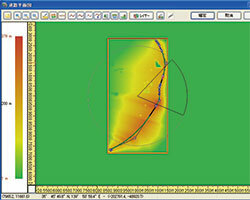 It is possible to visualize the result analyzed by S-PARAMICS. 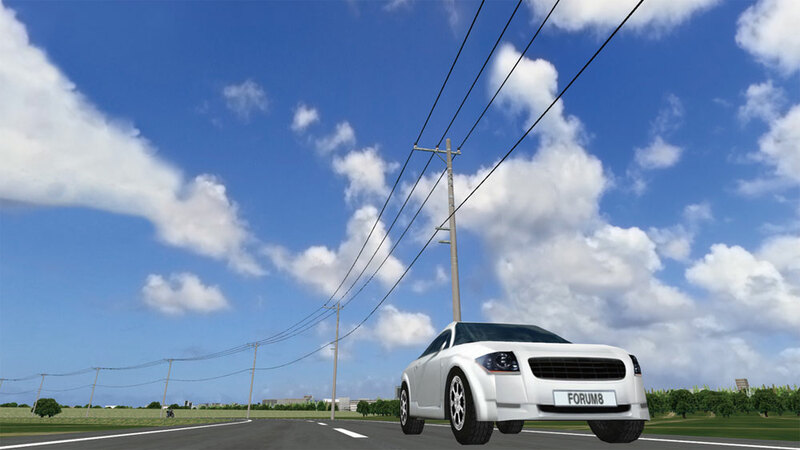 Plug-in for VR expressing the intersection designed by SIDRA by UC-win/Road. Data link of UC-win/Road and "EXODUS", evacuation analysis and "SMARTFIRE", fire analysis allows the viewing of the simulation result in 3D VR space. 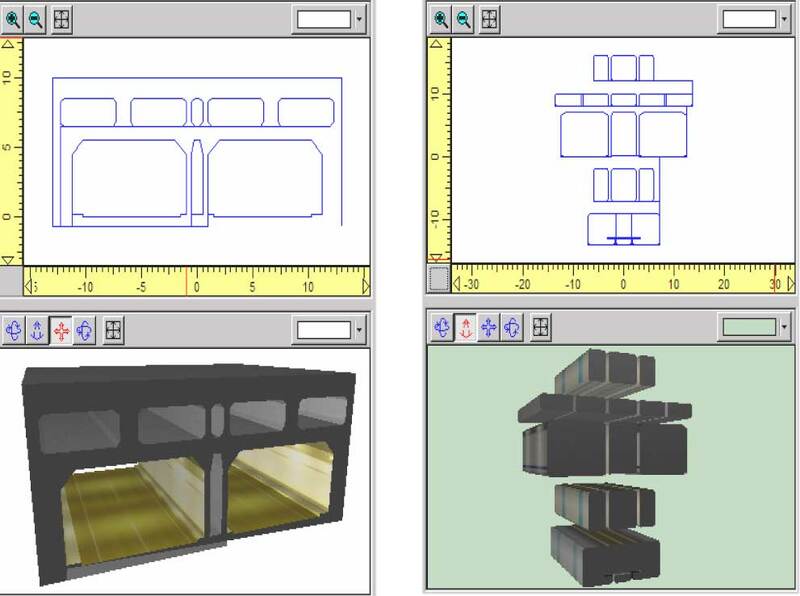 The Win series products such as UC-win/RC and FRAME (2D) have been made compatible with 3DS model creation one by one. 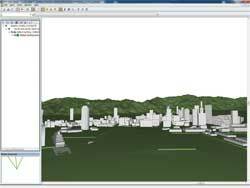 *The required free space for installment of the product including the terrain data and sample data is described. 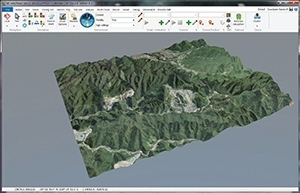 In addition the free space for saving the downloaded model/texture data from the created landscape data and special data, the recorded AVI file is required to use this product. *Greater than 10GB is recommended if considering downloading from RoadDB and the working range for AVI recording. *Please use the default setting for window design and the font size. Remarks Implementing DVD-ROM drive and sound board is recommended. 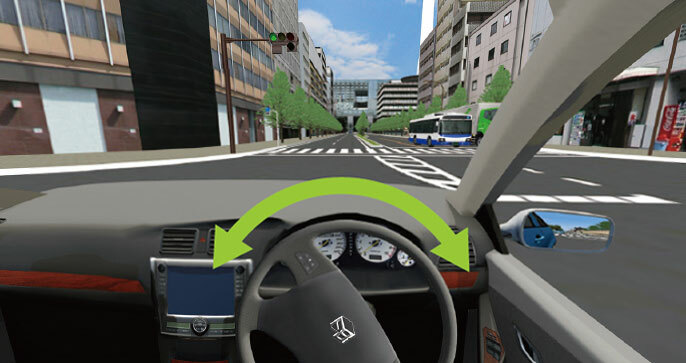 *When using driving simulation, it is recommended to use a commercial steering controller which can be connected to PC via USB. 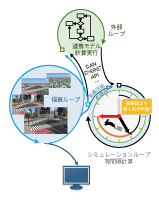 *When using RoadDB (sample data, download function of sample model), it is required connecting internet. 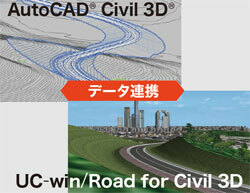 The Benchmark test result of UC-win/Road, UC-win/FRAME(3D)has been posted. 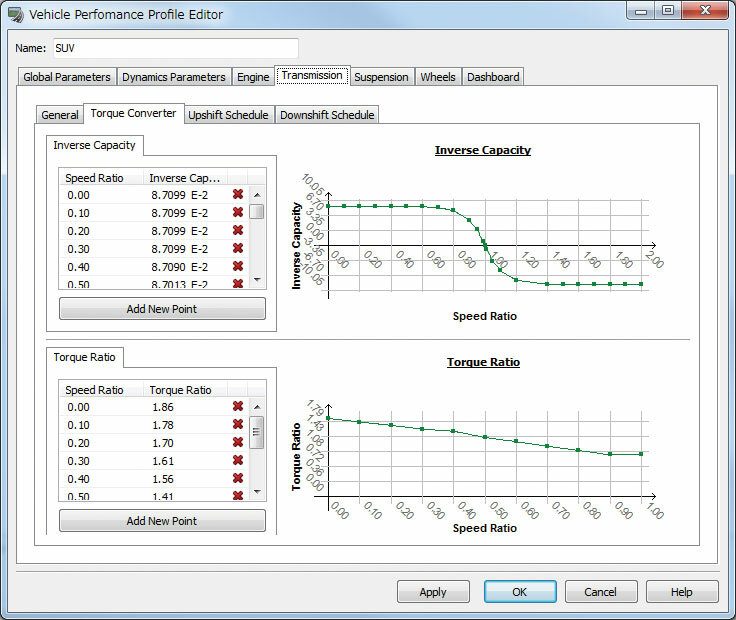 Our software performances, such as CPU, Memory, and Graphic adopter by a desktop PC and a notebook PC are available.